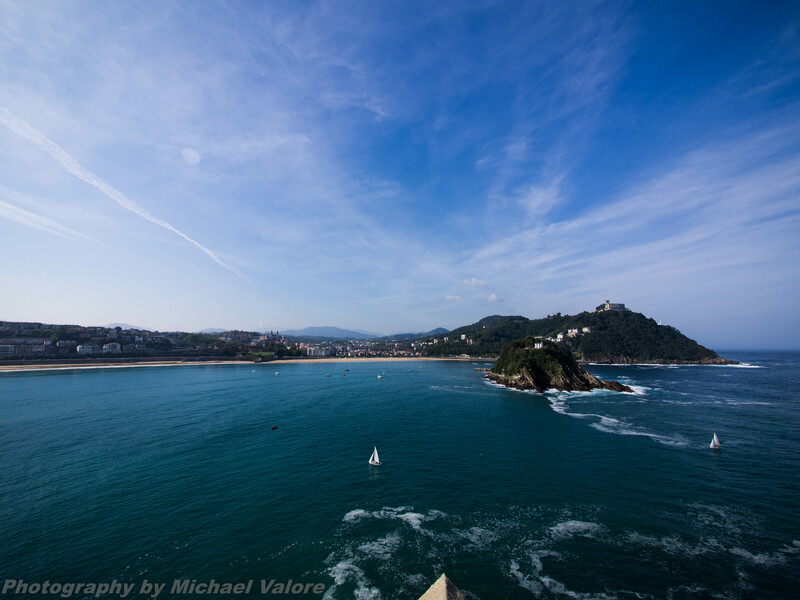 San Sebastian is located on Spain’s north coast less than 20 miles from the border with France. 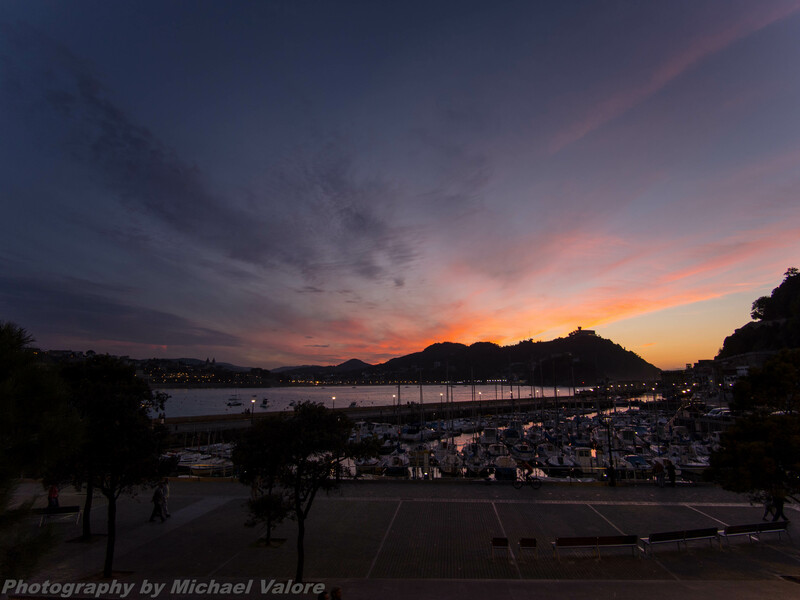 The city is also known as Donostia. There are two names and two languages noted for just about everything as this area is part of the semi-autonomous Basque region. Basque language uses the letter X frequently. You’ll notice it for sure. We stayed at Hotel Leku Eder which had beautiful ocean views and very comfortable rooms. From here you can catch the bus to just about anywhere in the town. Overall we spent three days and two nights here. Probably enough time unless you are planning to hit all of the top restaurants to be found. Akelare, Martin Berasategui and Mugaritz are also top establishments that we just didn’t have the time or the $ to dine in. 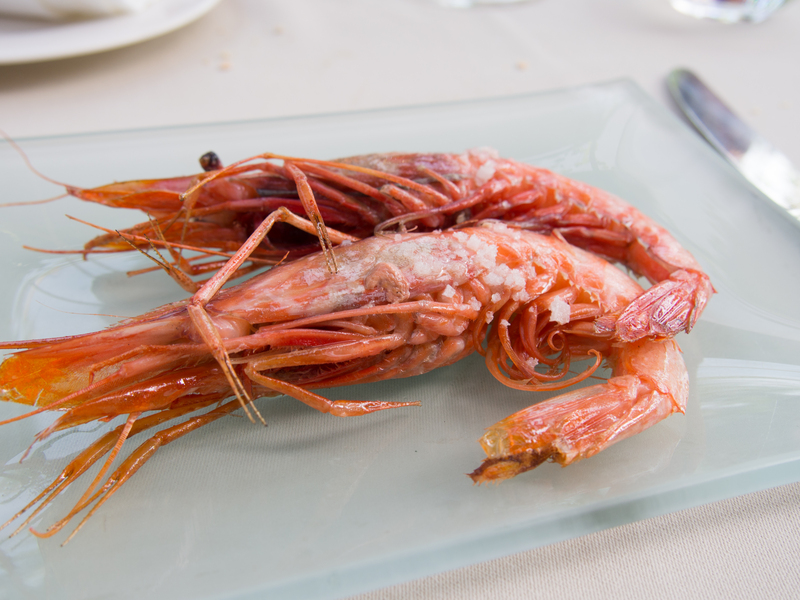 After arriving, we took the bus down to the opposite side of the bay to try Pintxos – small bites. 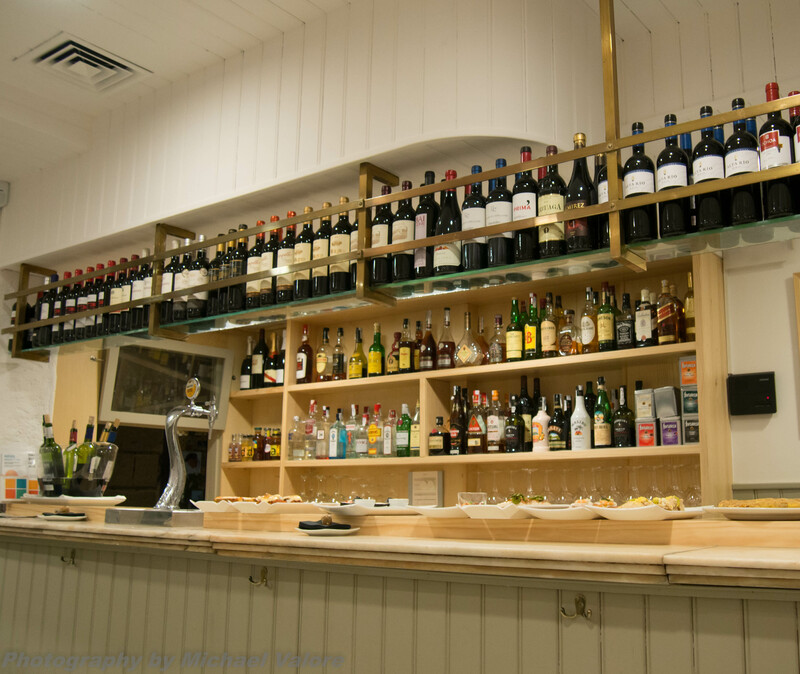 Dinner here if not at a top end restaurant, can easily consist of a few small plates at a bar accompanied by a glass of wine – repeating until full. After returning from lunch at Asador Etxebarri on day 2 (see previous post), we basically repeated the night of day 1. 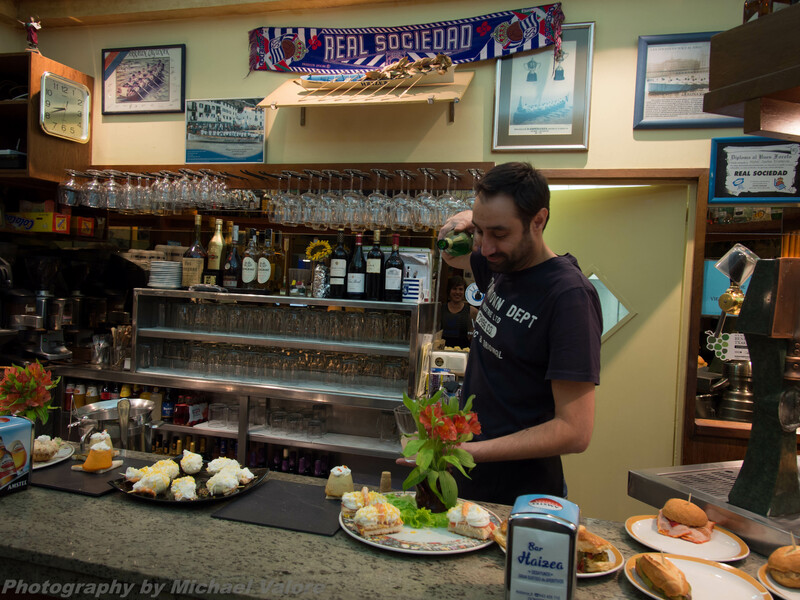 There are many pintxo bars to try, each with a different variety of plates and wines. On our last day, we hiked to the top of Monte Urgull which provides a nice view of the bay from the fortress at the top. The walk along the coastline at the base of Monte Urgull is also a nice stroll. After a day on the town we dressed up and made our way to Arzak – another of the top restaurants in the world. 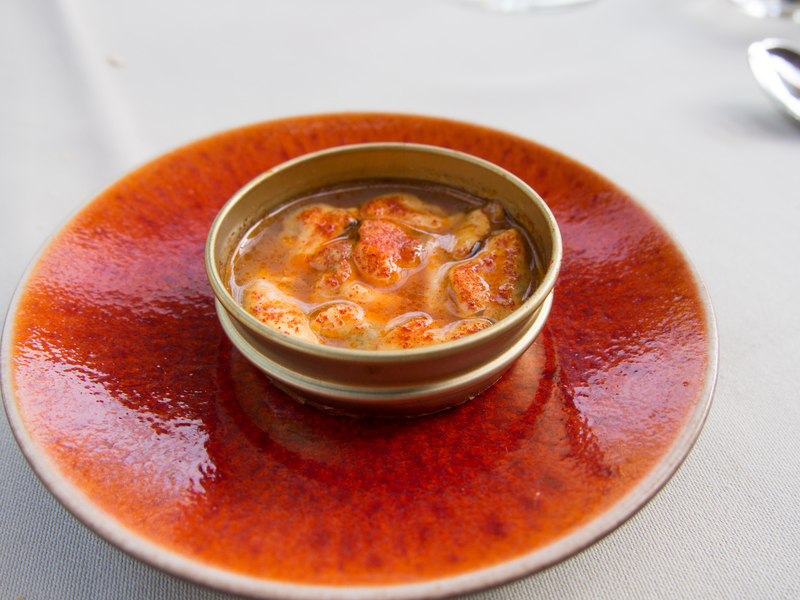 This entry was posted in Food, Travel and tagged Basque, Donostia, Food and Wine, Mike Valore, Photography, Pintxos, San Sebastian, Spain, Tapas, Travel on June 7, 2015 by Mike Valore. The capper on the trip to Spain was to head to San Sebastian for some fine dining at two of the best restaurants in the world. 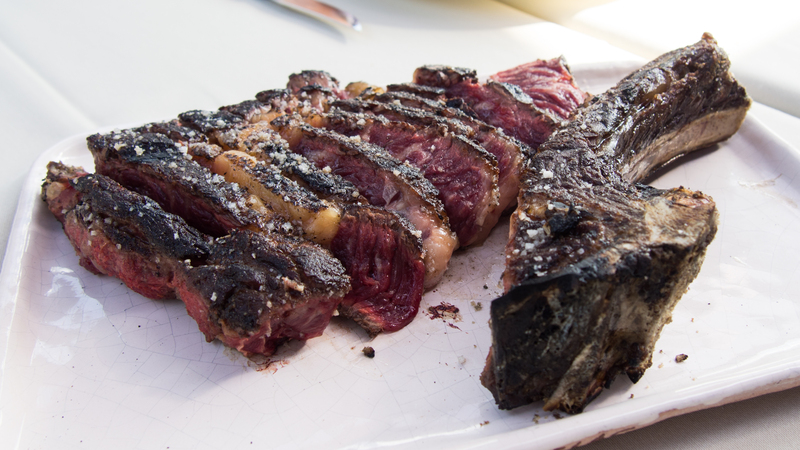 Arzak and Asador Etxebarri. 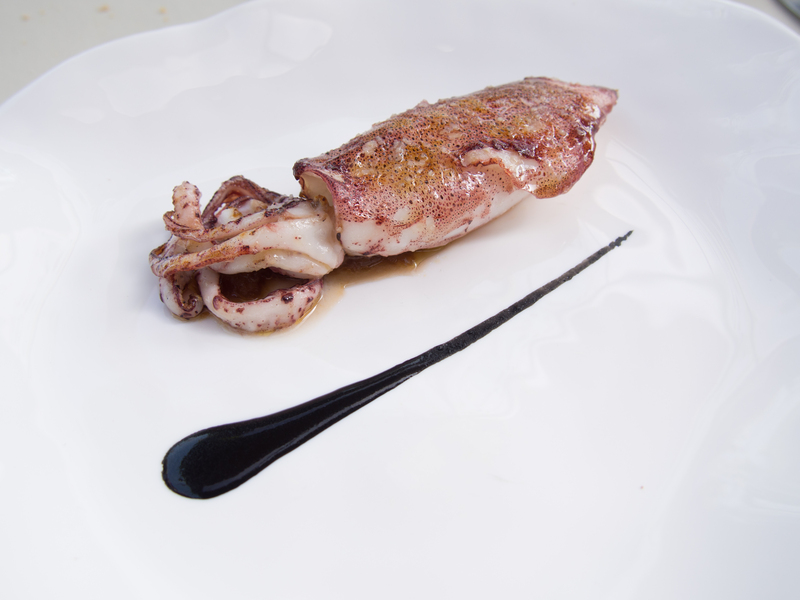 Asador Etxebarri has made the worlds 50 best restaurants list for seven years in a row and currently sits at number 34. Chef Victor Arguinzoniz is a grill master who fires every course over wood. Admittedly, we were drawn here by the Anthony Bourdain episode that featured the restaurant. Just about every review you can find validates this restaurant as one of the best you’ll ever find. We arrived nice and early. Many reviewers noted that the restaurant can be hard to find. We didn’t have any issues, phone GPS took us straight there. We wandered around for about 45 minutes, not much to see outside the restaurant other than a jai-alai court and a small farm. Not my best photography, eating is of course far more important. By the time the doors opened at 1:00 PM a few other groups had wandered into the town. We were seated upstairs on the balcony. After we settled in, we waited for quite a while before servers showed any interest in us. We started to get a little frustrated, it really was far too long before someone waited on us. Once we ordered our tasting menus and the meal started, all was well. The first four items came out together. The juice was good but not so memorable. The chorizo, butter and anchovies on the other hand, were amazing. While butter may not seem exciting, the combination of the salt and smoke made for an incredible combination. 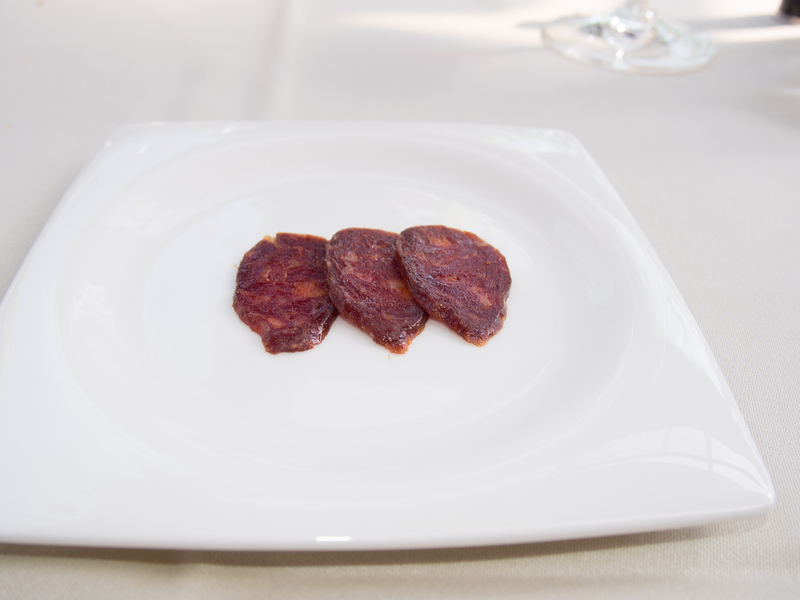 The chorizo was easily the best I’ve ever eaten. 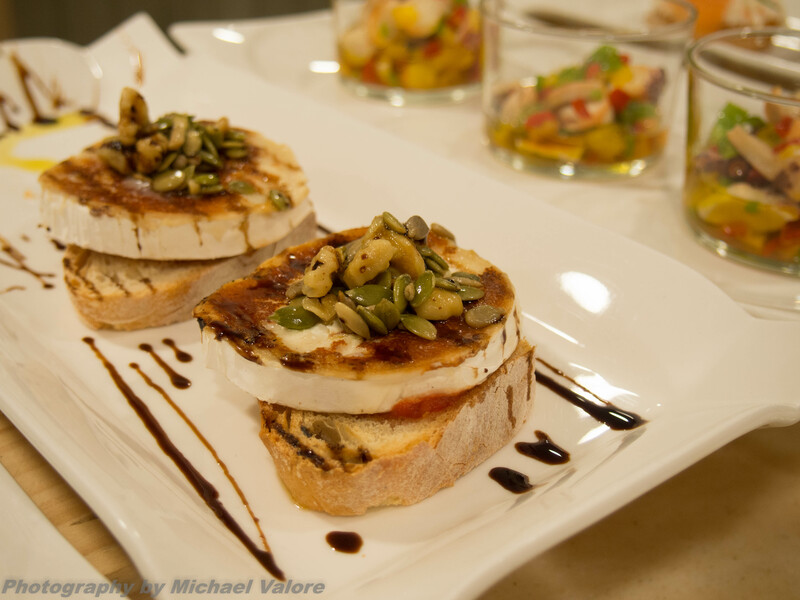 The anchovies were laid across a grilled pan con tomate. Perfect. 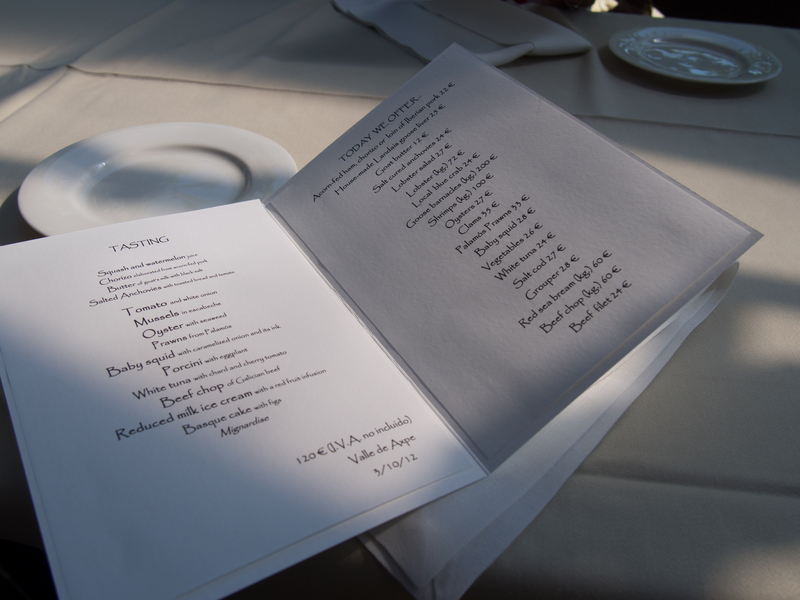 Following the initial four small courses we got into the main tasting menu. 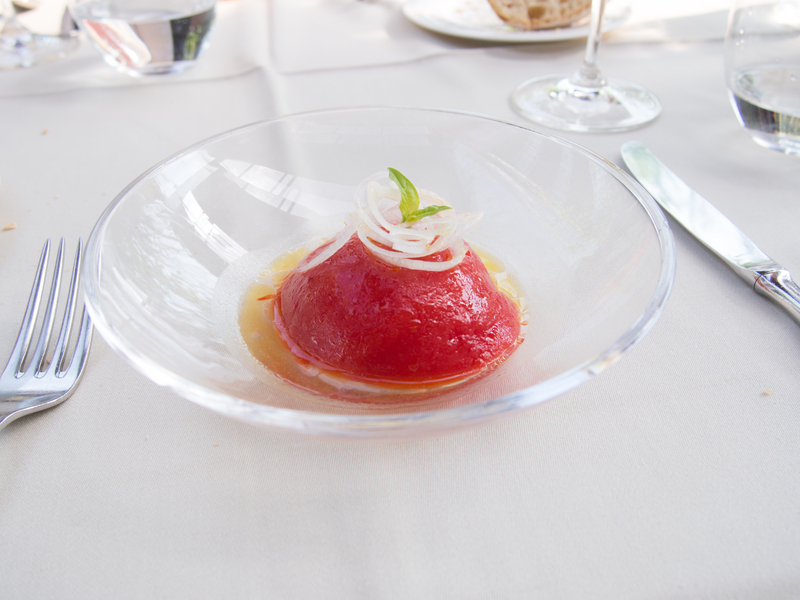 First out was tomato with white onion. Visually I was not expecting much. Looked a little like a boiled skinned tomato cut in half with some onions on it (see picture). Flavor and textures were a different story. The tomato was wonderfully tender and the onion added just a little crunch. I don’t know what was in the broth, but it would’ve been an excellent dish on its own served in a glass. 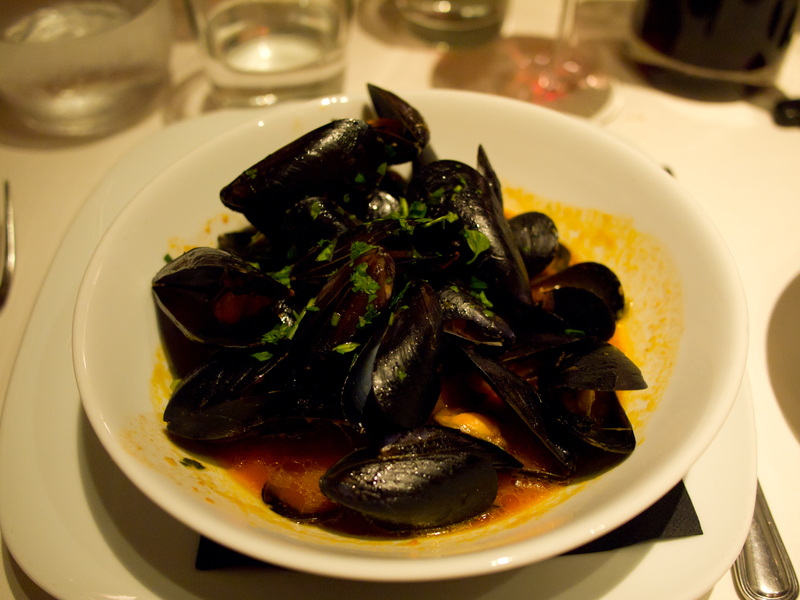 Next were mussels in escabeche. Flavors were good on this one but not too memorable. Probably one of my least favorites, but a fine dish. 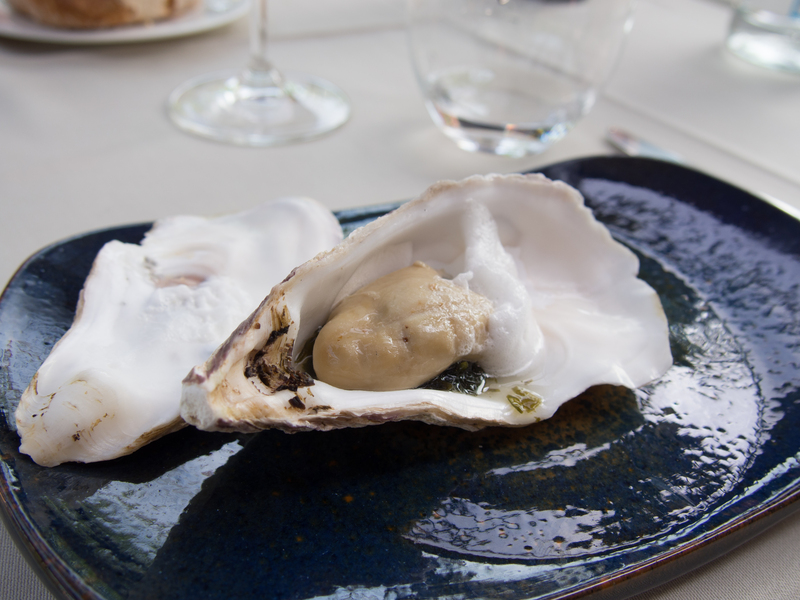 Continuing with seafood to start, out came a grilled oyster with seaweed. Also present was a little foam. The brininess of the oyster came through but the smoke flavor really made this unique. Next came the prawns. Having read many reviews of Asador Etxebarri online, this was an expected favorite. Smoky, sweet and salty. Perfectly cooked. Expectation met. The next course was astounding, at least to me. Apparently I had never eaten a properly cooked squid prior to this one. The tenderness was impressive. Once again the flavors were excellent. I also thought the plating on this one was particularly simple yet eye catching. The eggplant and porcini mushrooms came next to take the meal towards the steak finish line. Great flavors, but not as memorable as some of the other plates, I’d rank this one closer to the bottom along with the mussels and escabeche. As previously stated, this is based on a sliding scale where some of the other plates were absolutely amazing. Following the porcini’s was a surprisingly rich dish. 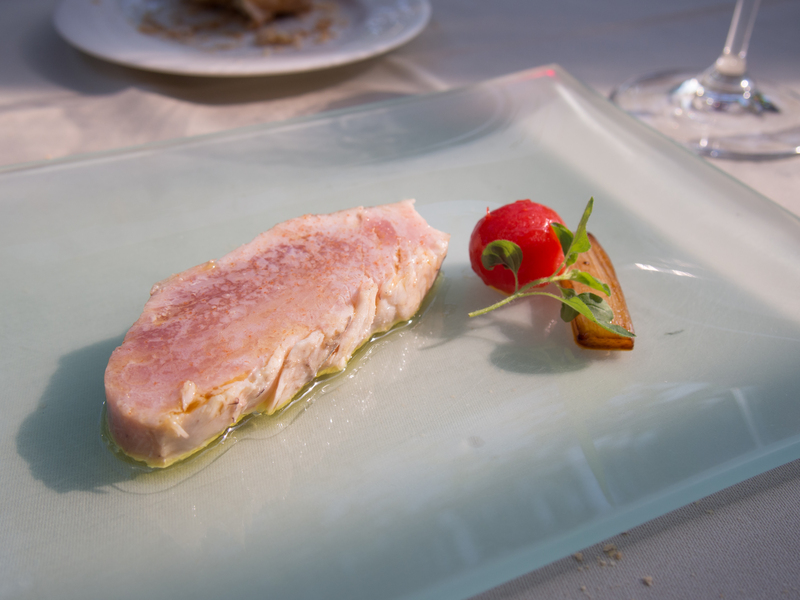 The white tuna was more like a foie gras in consistency and richness. I assume the cut came from a fatty section of the fish as it reminded me some of tuna belly. Next came the beef. Not much to say, the bone was clean when we were done. Really really clean. Dessert courses started with a smoked ice cream with a bery sauce. Not sure how they smoked ice cream, but this was the best of the two dessert courses. The second dessert course wasn’t as memorable. 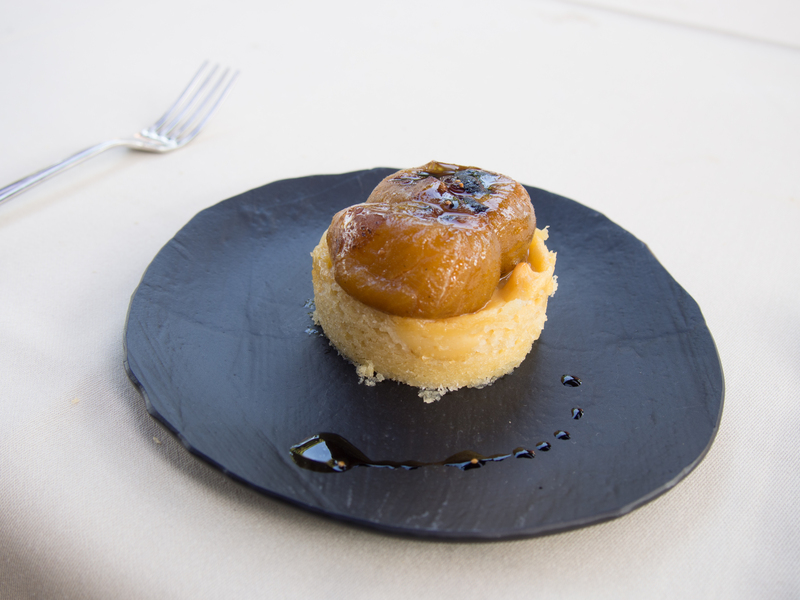 The Basque Cake with figs was good but similar to the mussels, not as strong as most of the other courses. 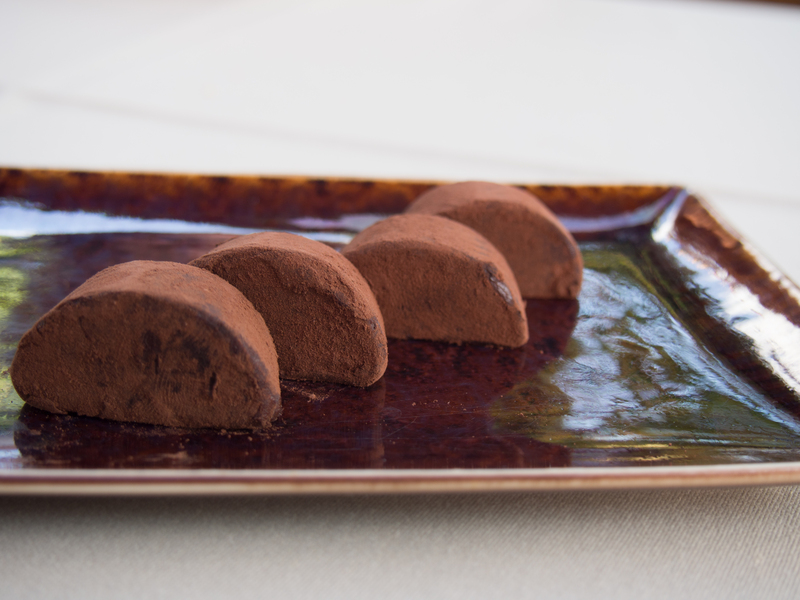 The mignardise – chocolate truffles covered on cacao powder. A nice rich chocolate capper after the lighter and spongier basque cake. Price was nosebleed, especially with a couple bottles of wine, but opportunities like this one come along rarely. 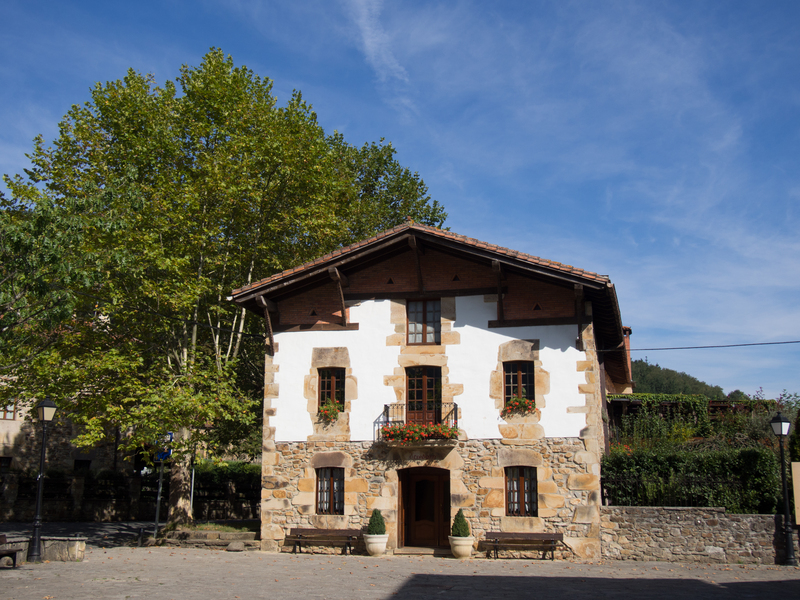 This entry was posted in Food, Travel and tagged Asador Etxebarri, Best Restaurants, Bizkaia, Food and Wine, Mike Valore, Photography, Restaurant, Review, San Sebastian, Spain, Travel, Victor Arguinzoniz on October 6, 2014 by Mike Valore. 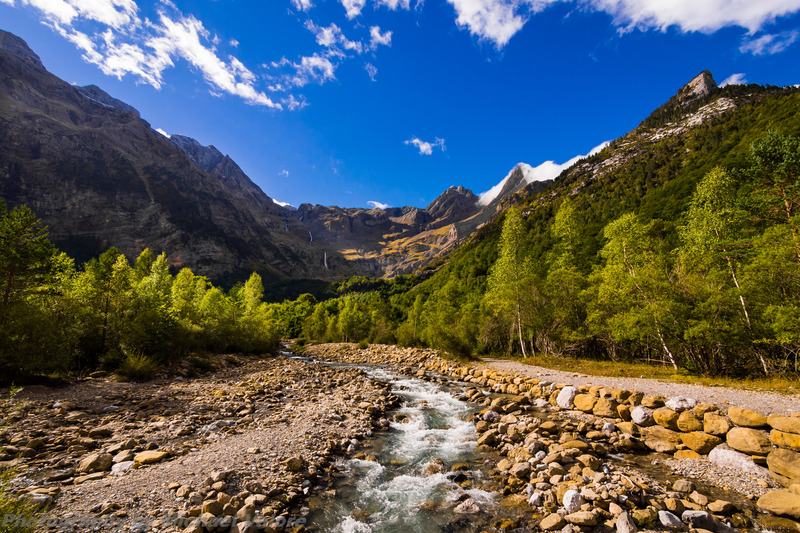 For our next stop we rented a car and drove from Barcelona into the Pyrenees Mountains on the Spanish side near the small town of Bielsa. 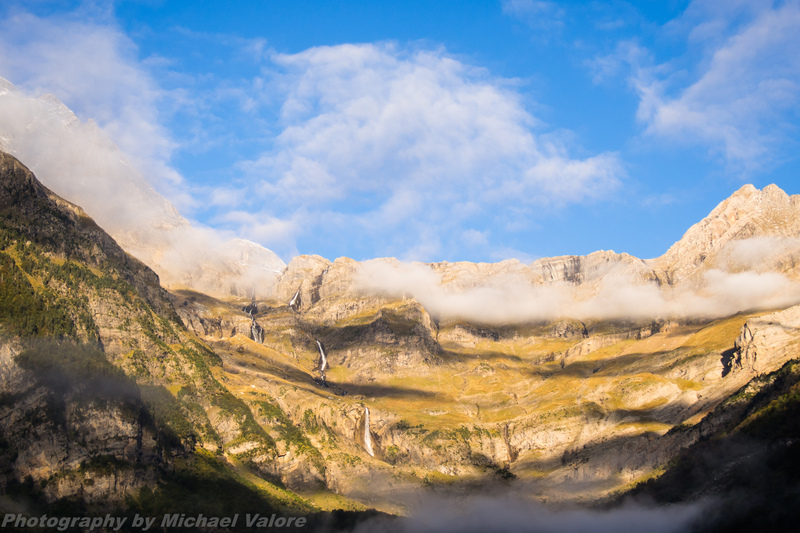 We stayed in the Parador de Bielsa hotel at the edge of Ordesa National Park (Ordesa y Monte Perdido Parque Nacional) on the Cinca River. 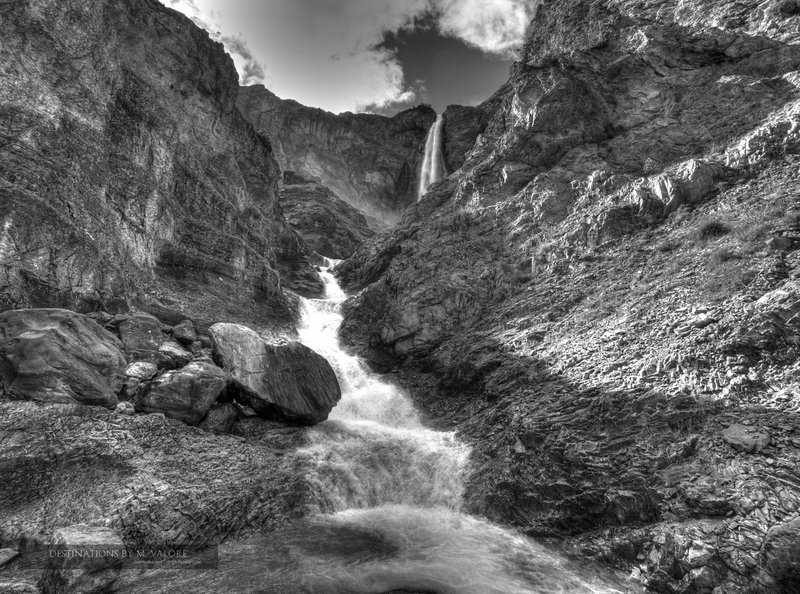 The hotel offers beautiful views of the surrounding mountains, including the waterfalls that cascade down from the peaks. The hotel restaurant is excellent, a welcome amenity since there aren’t many other options. The trout was a standout entrée. On our first full day we set out from the front door of the hotel and headed Northwest towards Monte Perdido and Lago de Pineta (also named Marbore). 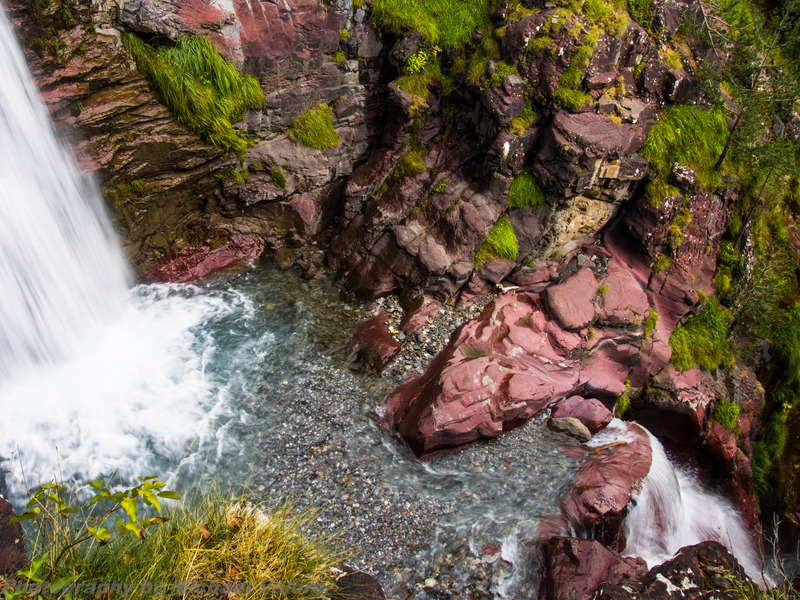 The scenery on the way was beautiful including several large waterfalls and a birds eye view of the valley. Halfway up cattle grazed on the slopes, apparently herded up and down from the mountainside daily (we could hear the bells as the cattle strolled by the hotel in the morning). The farmer must be in excellent shape, also beware of stepping in the large cow patties scattered about. The trail was steep in some parts and our feet were tired by mid afternoon. Hiking poles would probably have helped. Rather than push on and potentially return in the dark or just be exhausted, we decided to head back and drink some wine on the hotel balcony. On day 2 we took a drive across the border into France with basically no destination planned. After many switchbacks down and back up in elevation we ended up at Lac de Cap-de-Long not far from the town of Aragnouet. 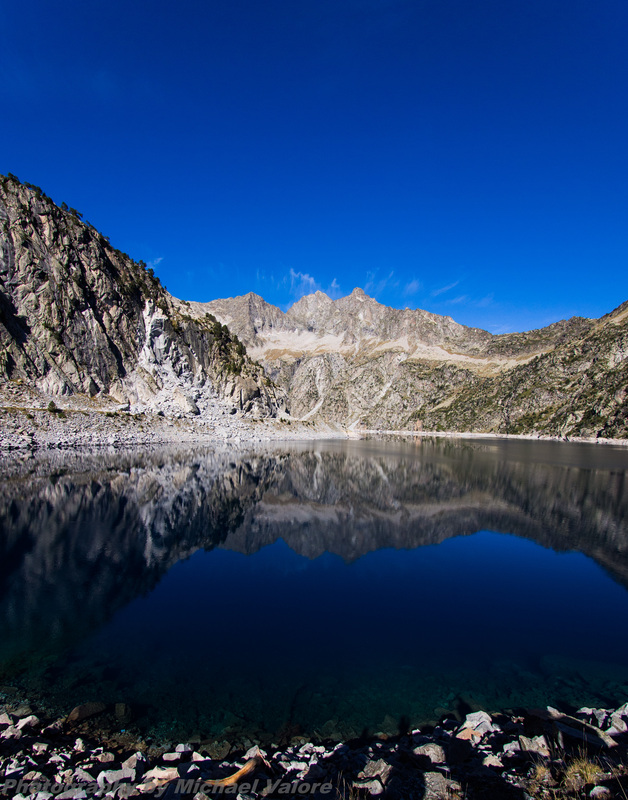 This lake and several others nearby were formed at high elevation by a man made dams. The water was a deep blue and very clear, trout could be seen swimming throughout the lake. Hungry, we found a restaurant in Saint Lary-Soulan for some savory crepes. Without much else to do we returned to the hotel and took another hike this time to the Northeast from the hotel to the Llanos de la Larri. The hike up to the Llanos (plains) was relatively short and steep but rewarding. 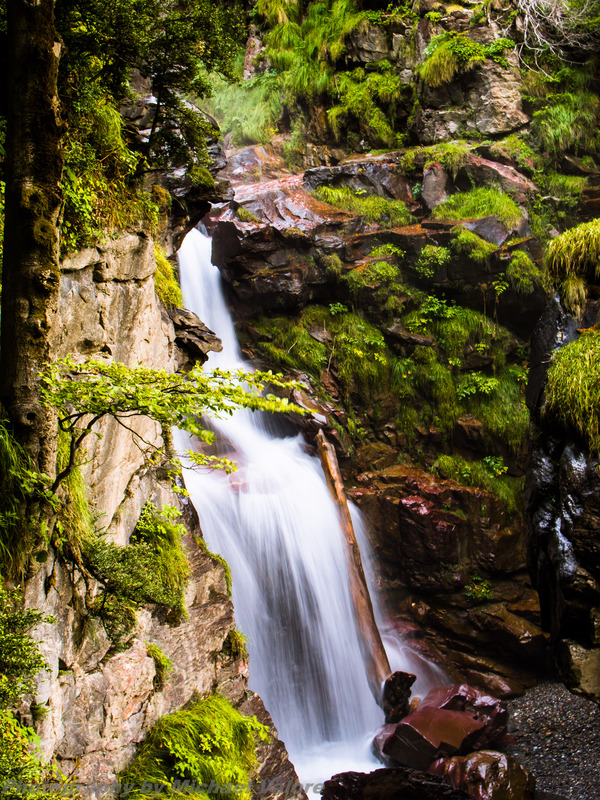 The trail winds upward adjacent to the Rio de la Larri which features several waterfalls that aren’t visible from the hotel. 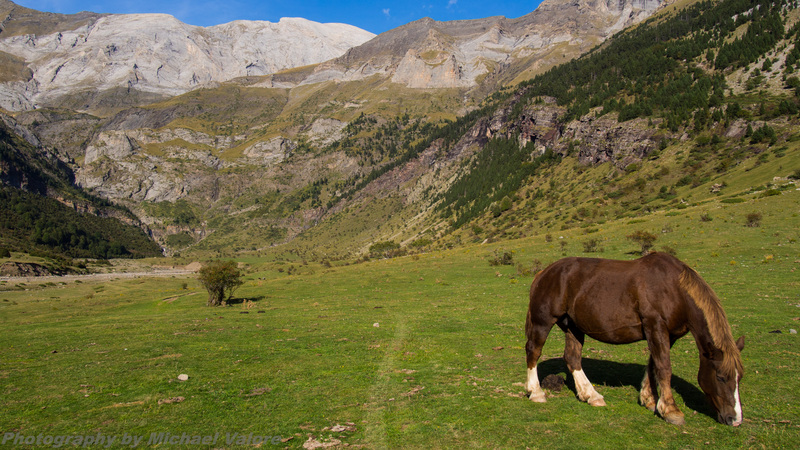 At the top there is a wide open area of grassy fields where horses and cattle graze freely. There is a small waterfall at the far end of the valley. Escaping the cities for a few days to get some exercise and take in some fresh air was perfect after Madrid and Barcelona. The trails were wide open in September and the hotel only appeared to be about half full. We encountered only a few other hikers over two days. Hiking here inspired us to head to Yosemite and book a different trip to Europe revolving around mountain hikes. 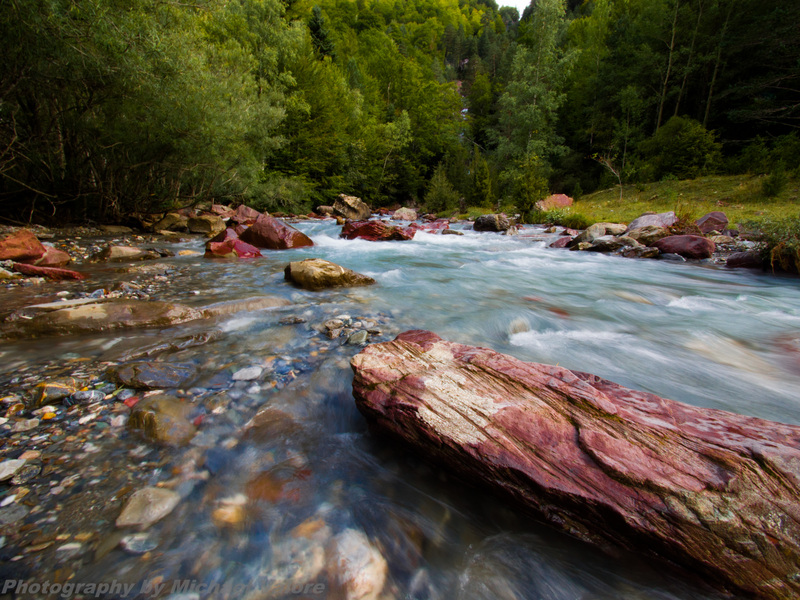 This entry was posted in Travel and tagged Bielsa, Cinca, Hiking, Llanos de la Larri, Mike Valore, Monte Perdido, Parador, Photography, Pyrenees, Rivers, Spain, Travel on September 8, 2014 by Mike Valore. 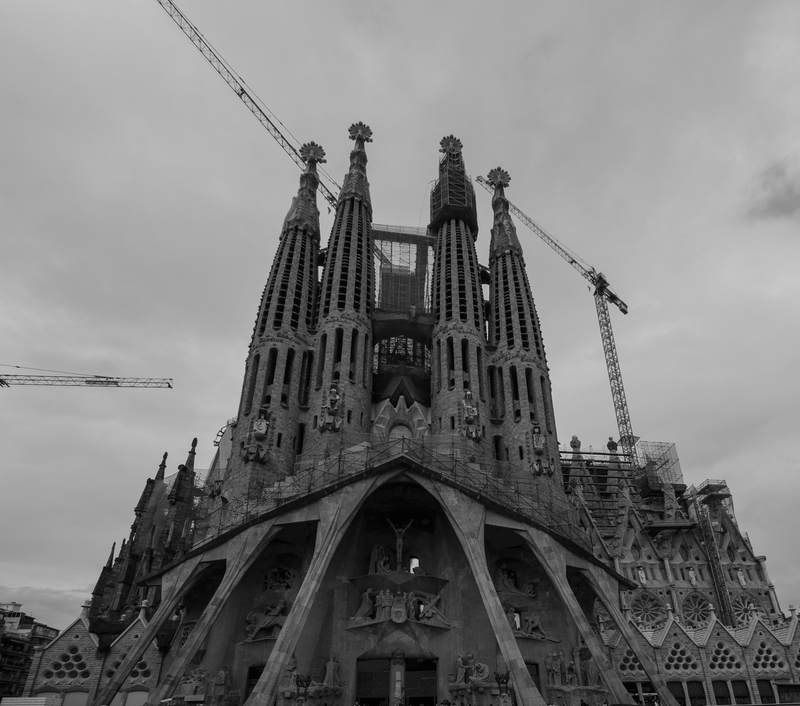 Tour of Spain stop 2 – Barcelona. We took the high speed train (Renfe Ave) from Madrid to Barcelona, only about a three hour trip. Lodging was found using Tournights which offers apartments for rent. There is a huge amount of things to see, do and eat here. Lodging is just about the last thing to be concerned with. 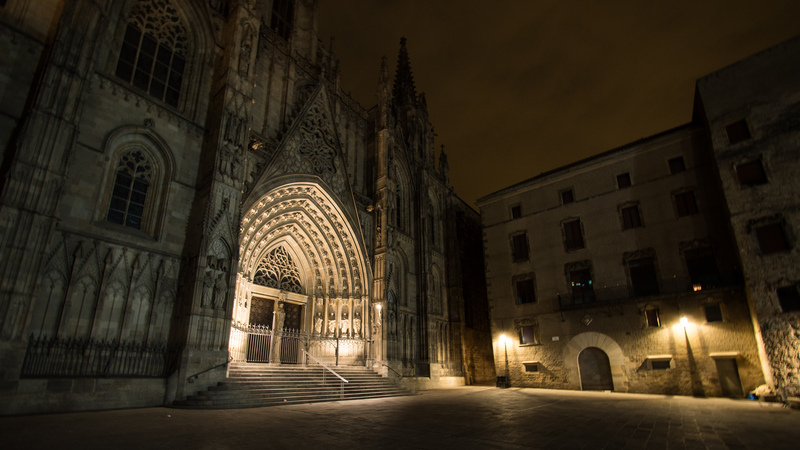 Immediately upon arriving in Barcelona you are immersed in architecture. 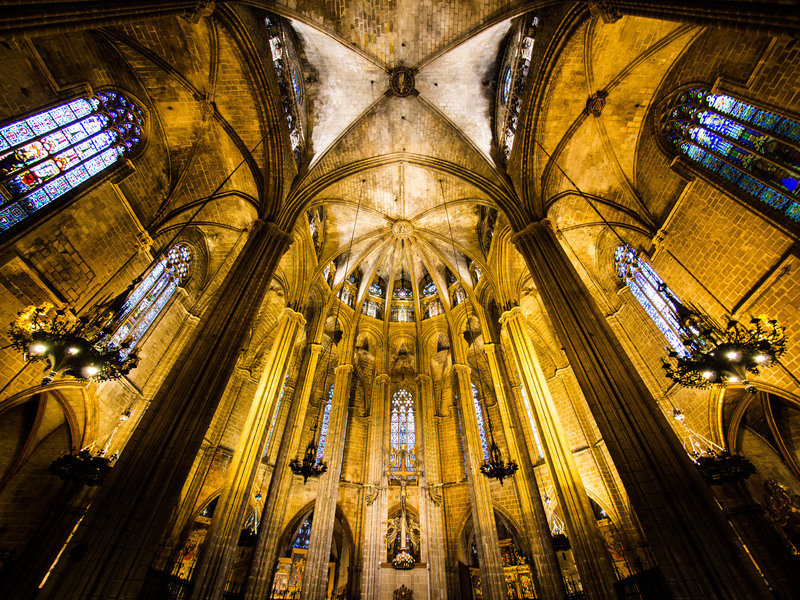 The Gothic style Cathedral of Barcelona is astounding in size and detail. 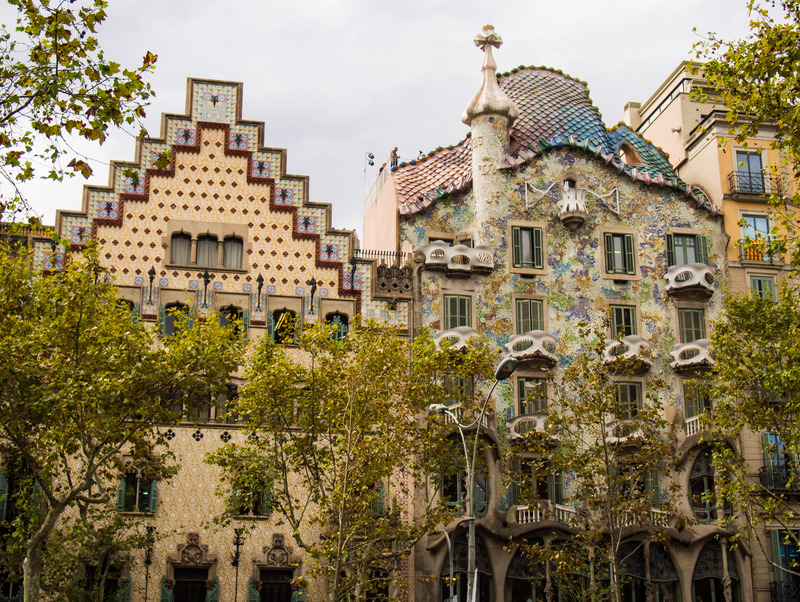 Numerous works of Antoni Gaudi such as Casa Batllo, Casa Amatller and La Pedrera draw the eye with their unique exterior facades. The over-arching feature (literally, no building is allowed to eclipse it in height) is another Gaudi design, the Sagrada Familia. This is one impressive church. Amazingly, after over 130 years of construction it still isn’t finished. The detail carved into each façade and the sheer size could elicit a religious experience. I suppose that might be the point. Also home to Barcelona is one of the most famous markets in the entire world – La Boqueria. 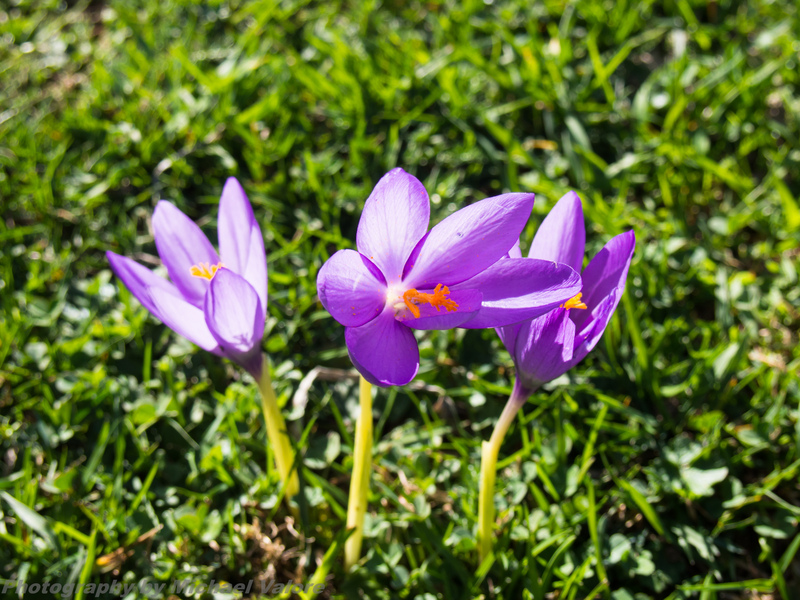 The colors, variety and action could inspire just about every amateur photographer. Sadly I turned into just another tourist taking pictures of fish and meat, but for some reason you just have to do it. 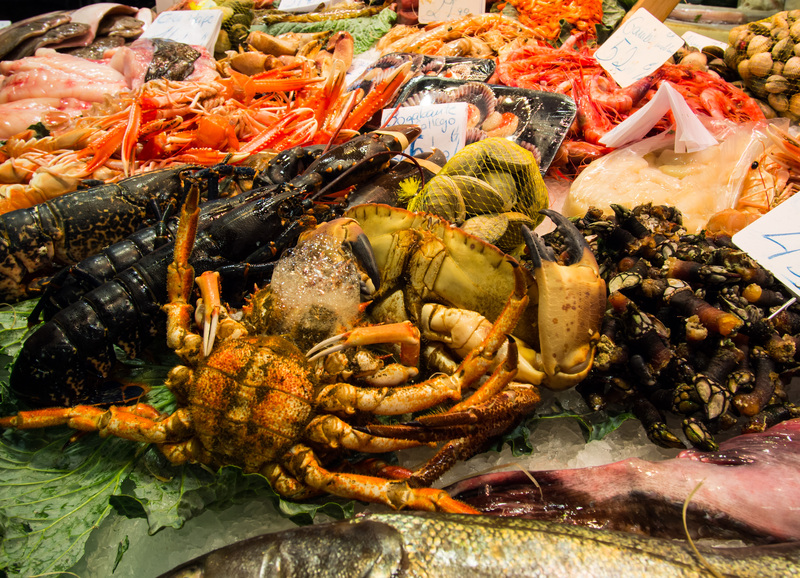 Fresh seafood can be had in the corner of the market for lunch or dinner at Kiosko Universal. Highly recommended. We did two tours while in Barcelona. 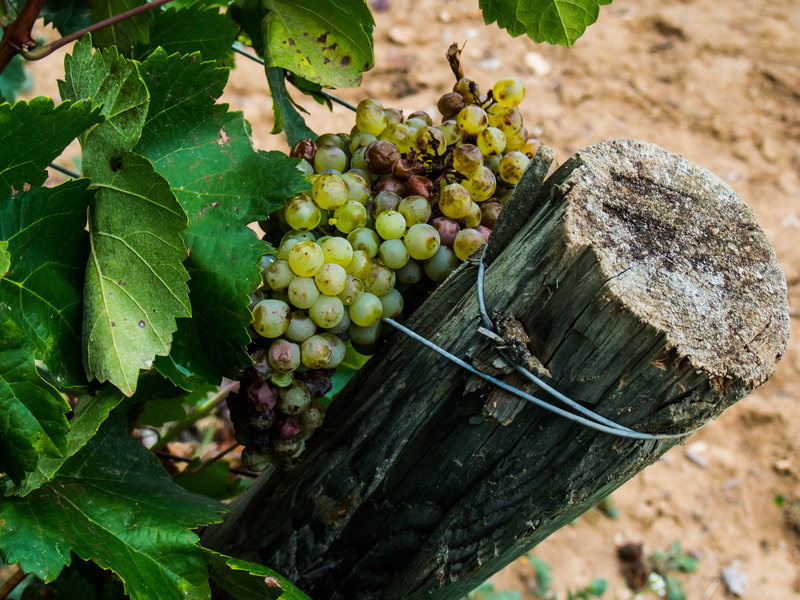 A free walking tour and a bike tour to several wineries in the Penedes region. These two tours were probably the two most enjoyable travel tours I’ve experienced so far. First the walking tour. The tour guide (Chris G.) was knowledgeable and engaging – even several years later I still recall many of the highlights of this tour which is rare for me, usually in one ear and out the other. We also stuck around for a paella demonstration dinner. 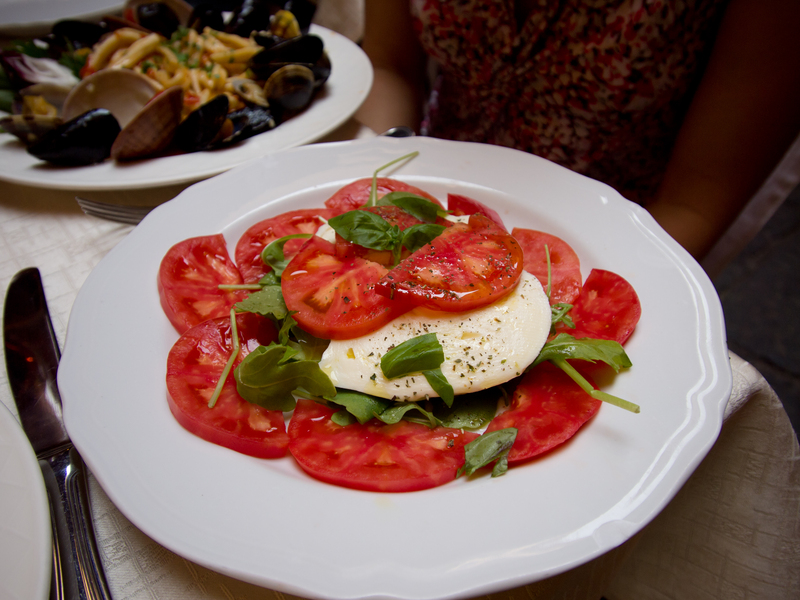 Fresh ingredients from La Boqueria, cooked and into the belly. 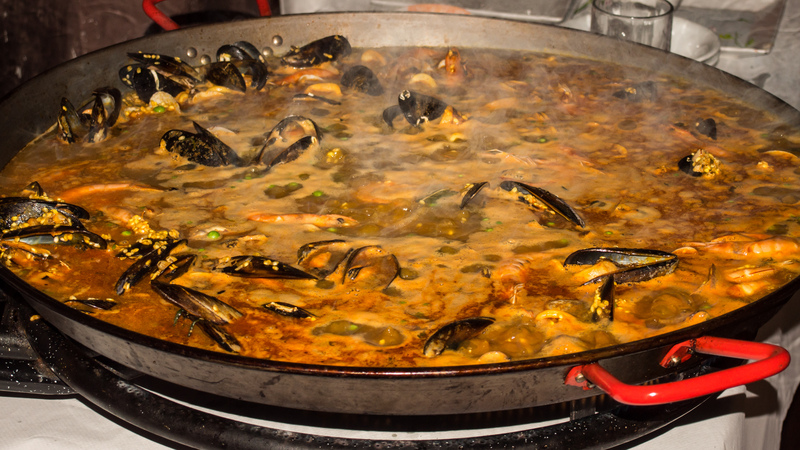 Paella can’t and won’t be any better than that. The bike tour was almost a requirement after all of the eating and drinking. At least some exercise was needed to continue to eat and drink. We chose a tour of Penedes run by Spanish Trails. Albert was the friendliest and most excited tour guide of all time. Biking was easy but fun through some beautiful country. The wineries specialized in Rioja, Tempranillo and an even more unique dry sparkling wine called Cava. We purchased several bottles which the tour loads up in a van for you so you don’t have to carry it while biking. The highlight of this tour and perhaps our entire trip to Spain was the meal following the tour, hosted by Albert and his family. Traditional simple Catalan dishes were served family style and more wine was served, including a dessert wine from the porron. Each took a turn trying to pour wine like a fountain held high at arms length straight to the face. Later in the trip we went to two of the top restaurants in the world, both amazing and unforgettable in their own right, but this was also a meal to be remembered. 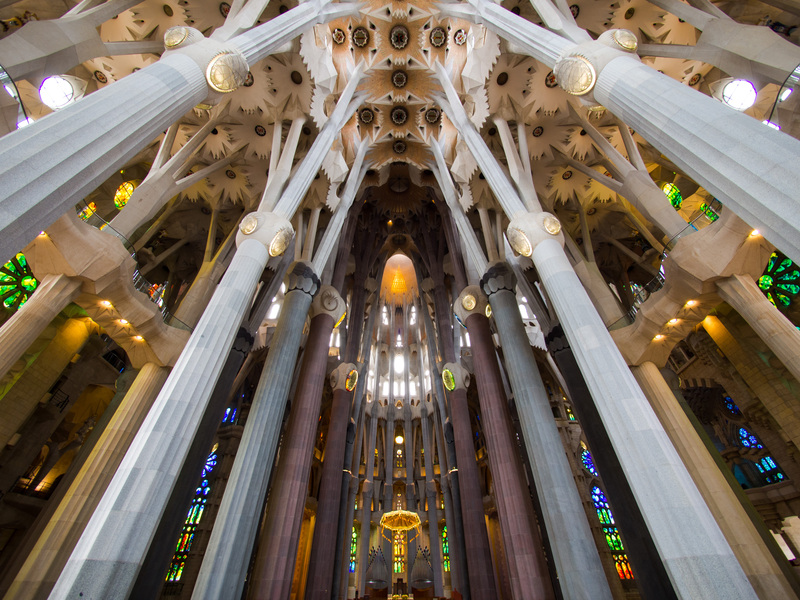 This entry was posted in Travel and tagged Architecture, Barcelona, Cava, Espana, Food, La Boqueria, Mike Valore, Photography, Sagrada Familia, Spain, Travel, Wine on August 31, 2014 by Mike Valore. Madrid was the first stop on our trip to Spain. Centrally located with reasonable airfare landed it atop the batting order. From Madrid to Barcelona, Barcelona to Ordesa National Park in the Pyrenees and finally on to the food capital of the world, San Sebastian (return flight from nearby Bilbao). My wife and I traveled here with some close friends after their wedding. The trip was quickly coined Luna de Miele (loosely honeymoon?). We stayed at an excellent bed and breakfast called Abracadabra B&B just a block or so away from the Palacio Real and Plaza Mayor. Breakfast was great and the rooms were quiet and well kept. Highly recommended. 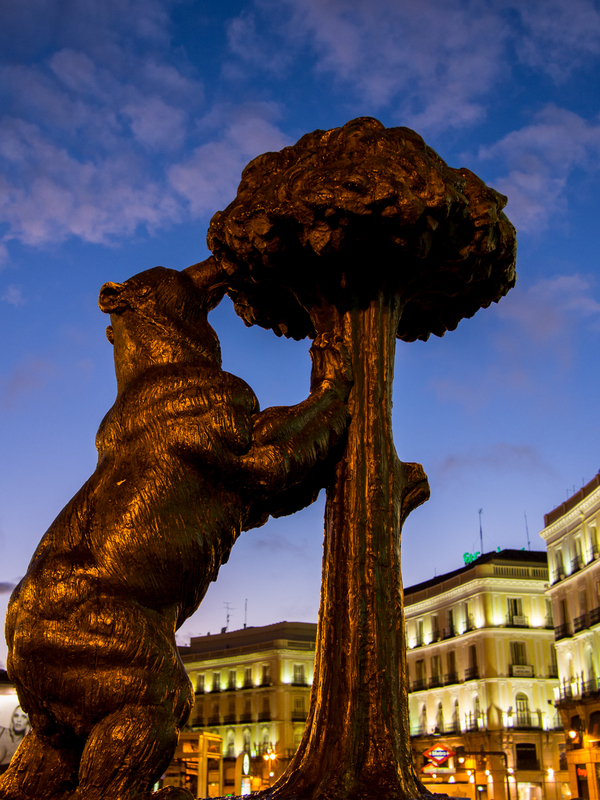 We hit some of the key tourist spots such as the Palacio, Plaza Mayor, Prado Museum and the Reina Sofia Museum. Intersting stuff but I wasn’t blown away by any of these sights. 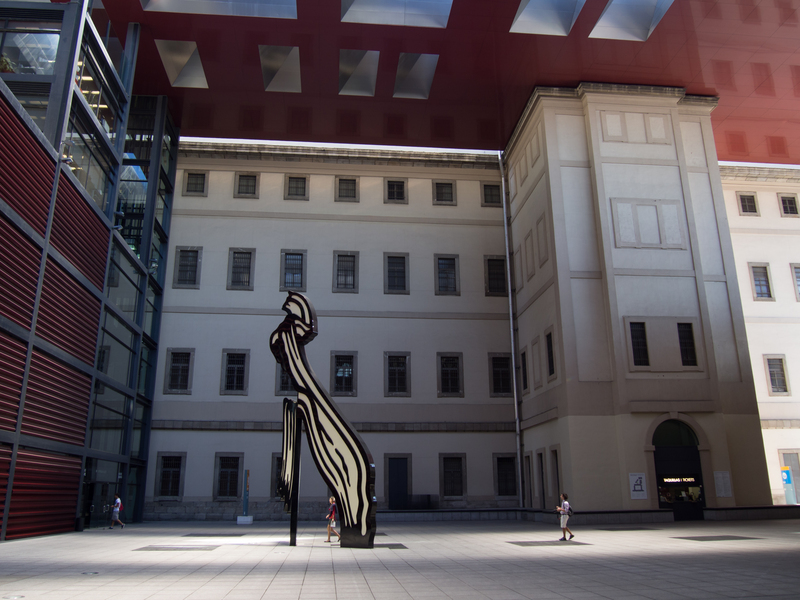 Picasso’s Guernica in the Reina Sofia was memorable. The claustrophobic outdoor El Rastro street market and the Mercado San Miguel were the must sees. My first taste of Jamon Iberico as well as other small bites at the Mercado will be planted in my memory for years to come (I admittedly appreciate food more than paintings and sculpture). 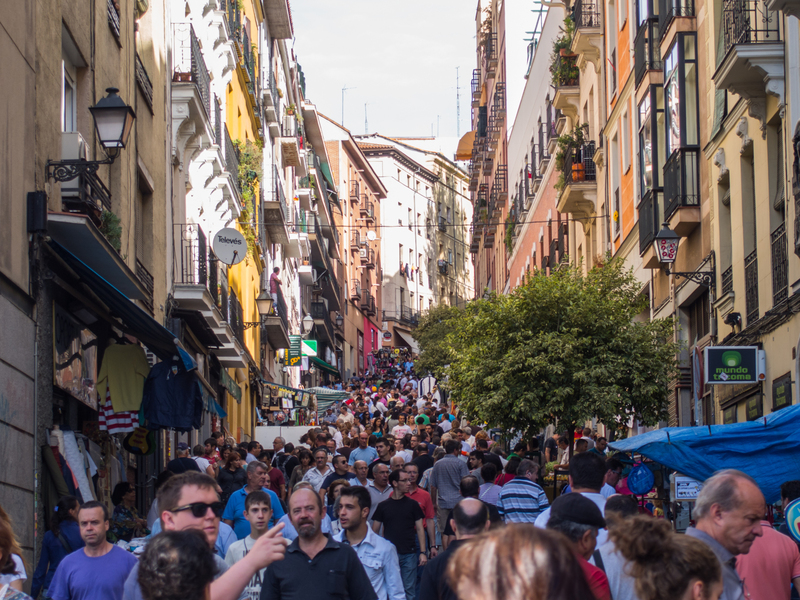 The sheer size and volume of people at El Rastro was unforgettable. The streets were flooded with shoppers, entertainers and storekeepers. Just about anything could be found on sale. I recall a specific tent specializing in VHS tapes and another with casettes. Jamon aside, Madrid was my first shot at quite a few traditional Spanish dishes/styles. Papas Bravas, Paella, and Tapas to note a few. 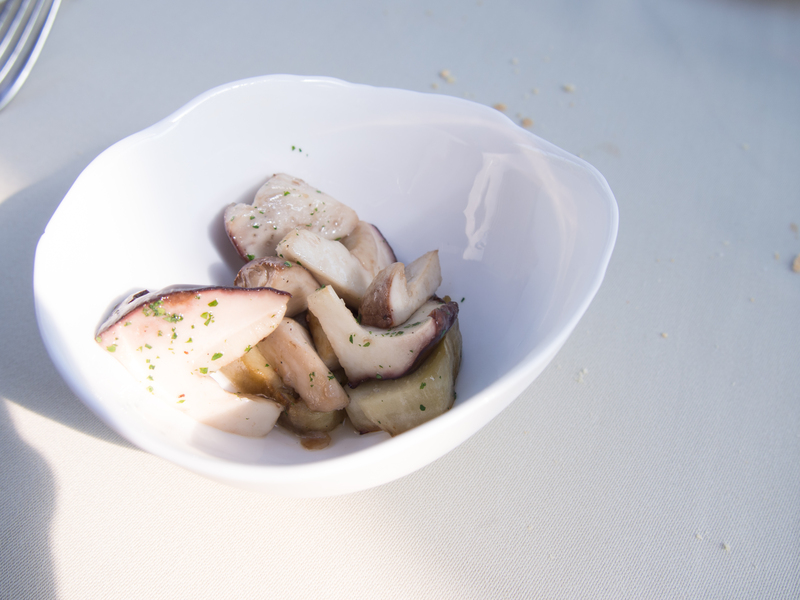 Our most memorable moments came from bar hopping and savoring a variety of small dishes along the way. Rioja wine also made quite a few appearances. 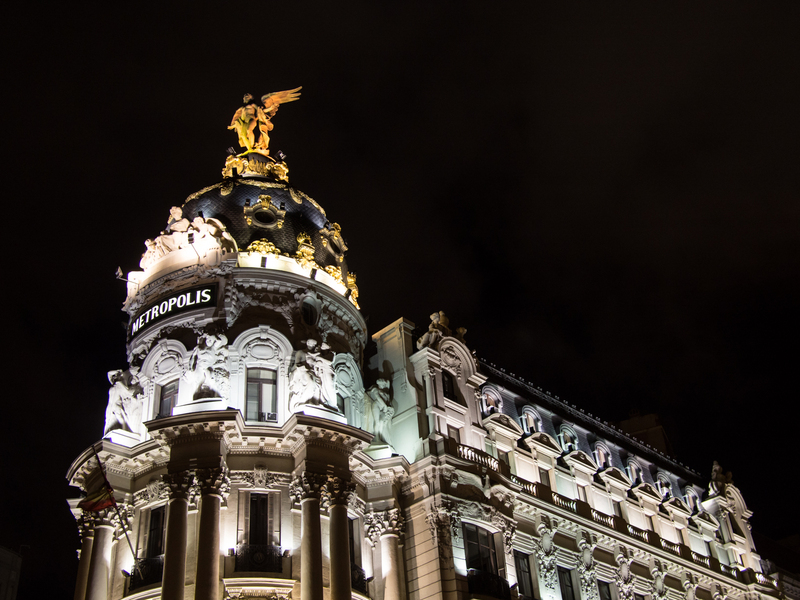 Madrid is a great starting point to get over some jet lag and start to experience Spain. Variety of experience but relaxed. 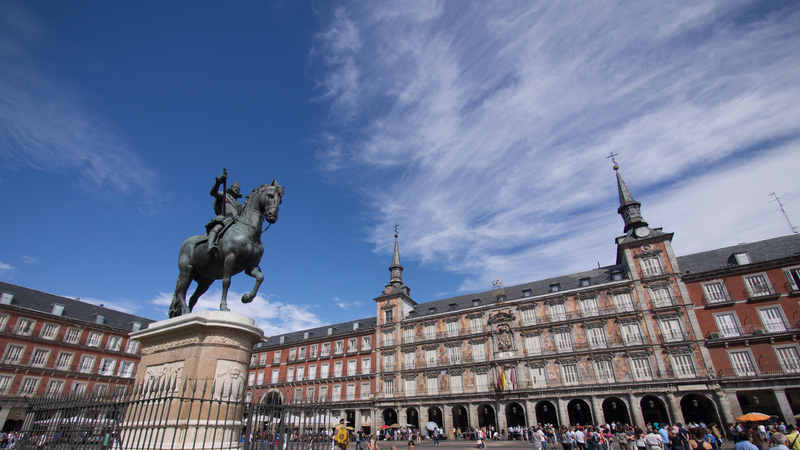 Major sites all within walking distance of Plaza Mayor. Fewer tourists than Barcelona. Some sightseeing and bar hopping here should satisfy just about anyone. This entry was posted in Travel and tagged Bear and Madrona, El Rastro, Espana, Madrid, Mike Valore, Olympus, OMD EM-5, Photography, Plaza Mayor, Prado Museum, Reina Sofia, Spain, Travel on August 4, 2014 by Mike Valore. 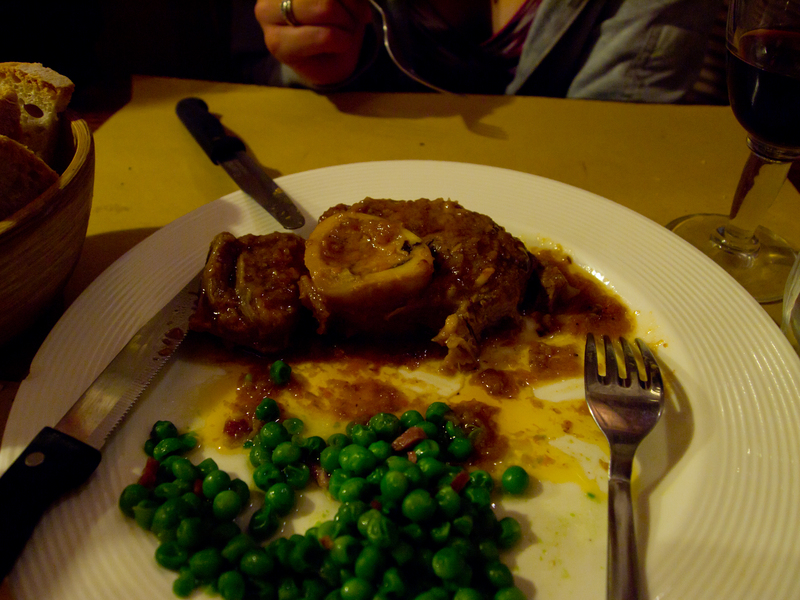 Basically every meal we had in Italy was fantastic. Tripadvisor and other review sites really make it quite simple to find quality. Given that, there were of course some standouts. 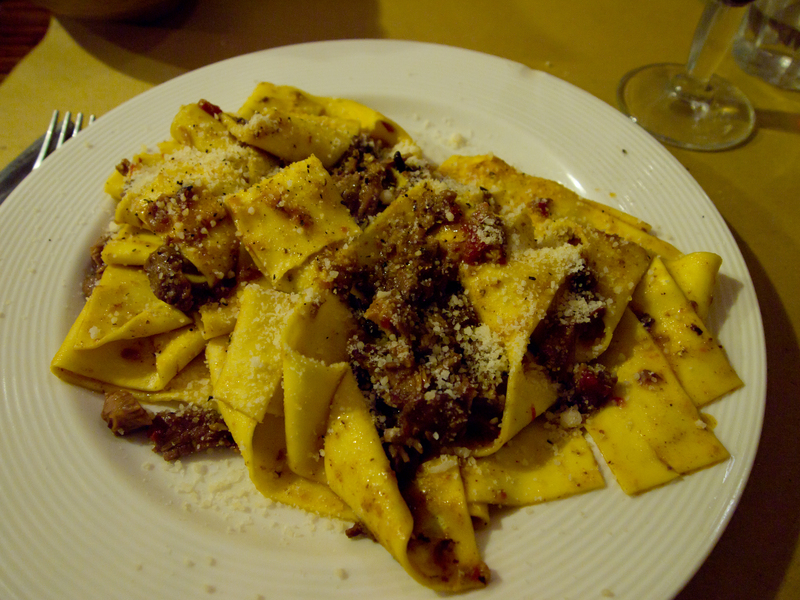 Here are the top dining experiences we had across Rome, Naples, Florence, Venice and the Cinque Terre. 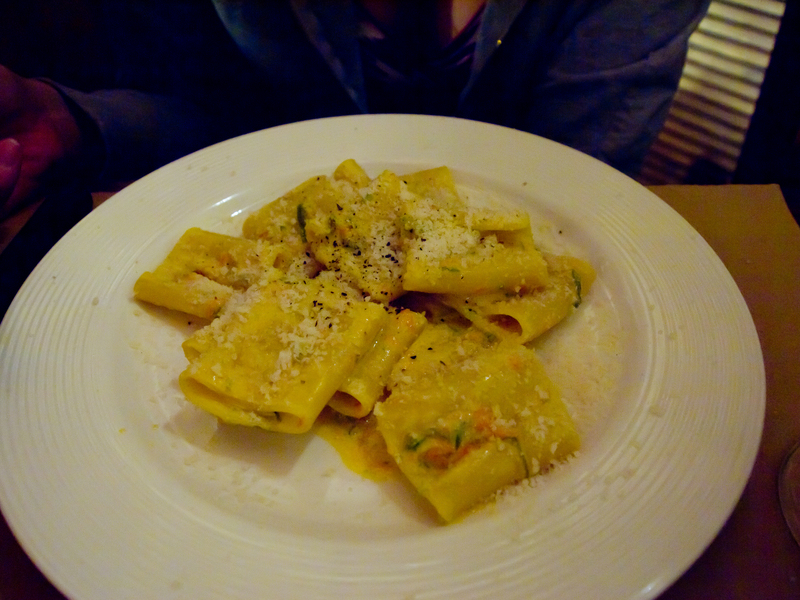 Admittedly not my best photography, but it is hard to care about taking photos when presented with food like this. No Pizza, no Bistecca, no ice. This sign is posted right out front, this is not a pizza joint, not a Florentine steak house, and they do not have soft drinks. There are about five tables and the place is run by a small family. Reservations are required or you basically have no hope. The location is also very convenient as it is right next to the Medici palace. Simple, very reasonably priced and fantastic. 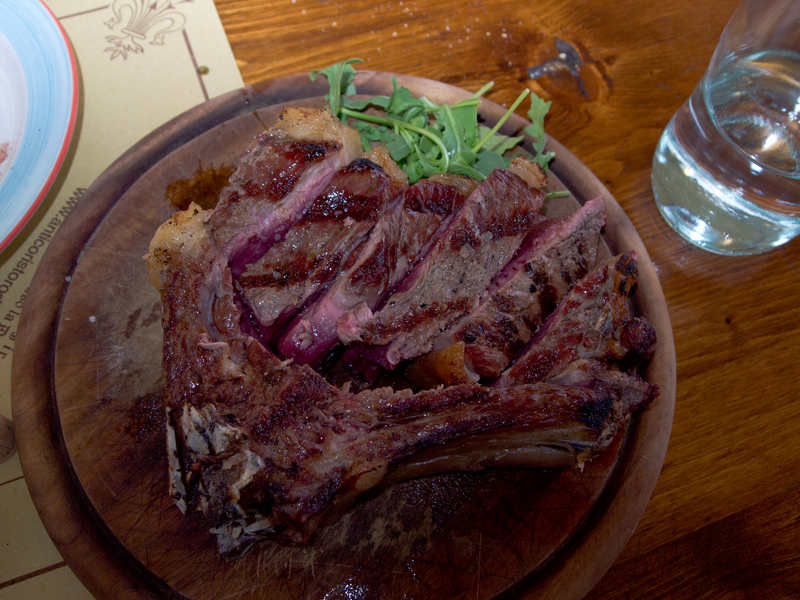 Bistecca Florentine. This steak alone pushed me from normally ordering steaks prepared Medium to now exclusively ordering Medium Rare. This was conveniently located for us, there may be better Bistecca to be found, but cheap wine and a delicious steak is still a great experience. House wine comes by the jug. Made famous in the novel and movie Eat, Pray, Love (at least according to my wife) this place is on the map. Deservedly so. 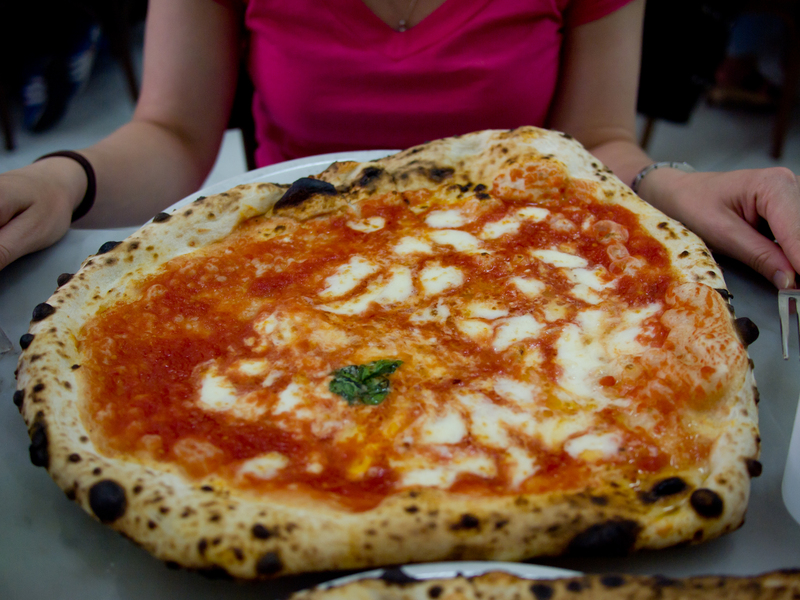 Gigantic pizza but so good you can easily eat a whole one yourself. Sauce, Mozzarella and a little basil is all any real pizza needs. Pasta cooked to perfection. 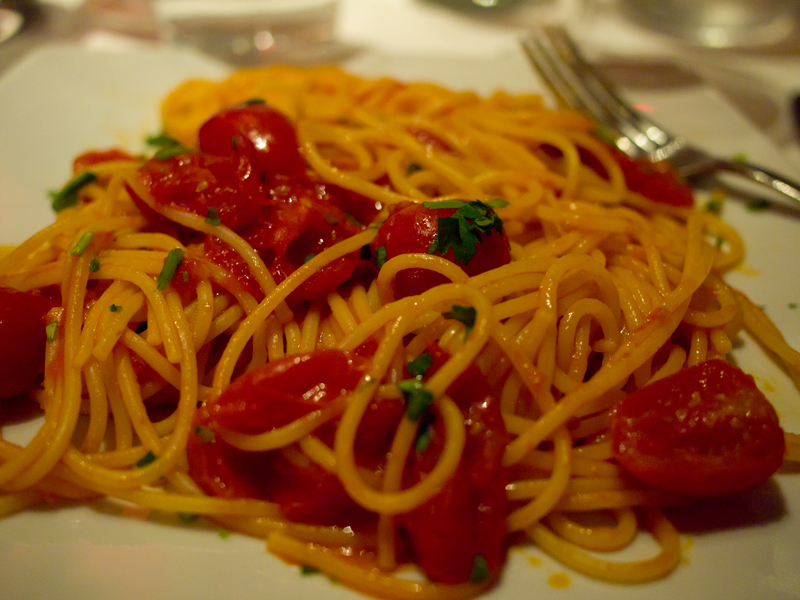 More al dente than I’d ever had before. I don’t think I’ve had pasta prepared this well since. Wasn’t sure what to expect here, suspected it might be a bit of a tourist trap however the quality of the food was excellent. Stopped here for lunch while strolling the streets of Sorrento. 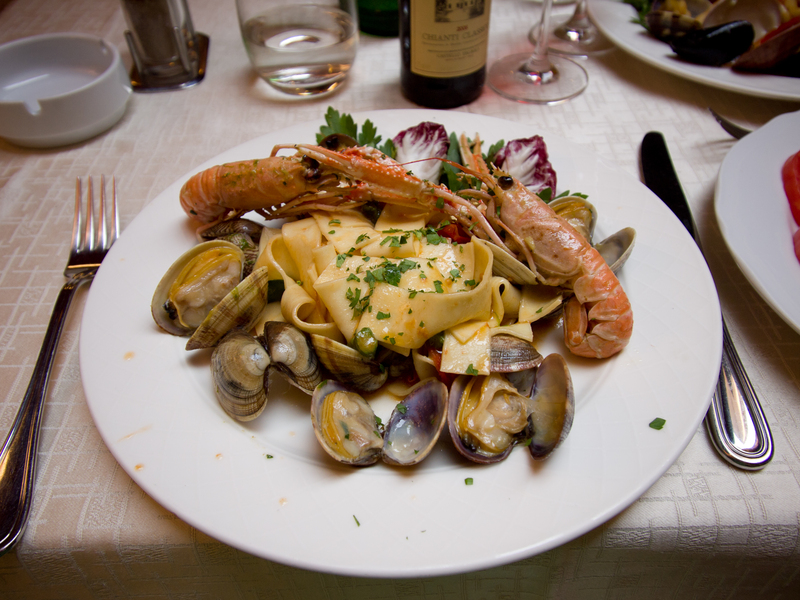 The pasta was prepared perfectly and the seafood was fresh. More simply prepared dishes executed perfectly. 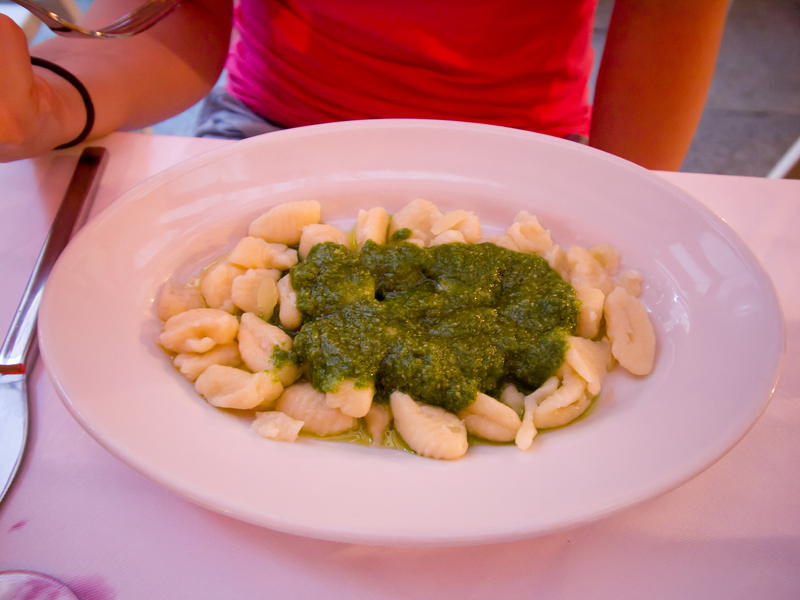 The Cinque Terre region is famous for Pesto and seafood, specifically anchovies. 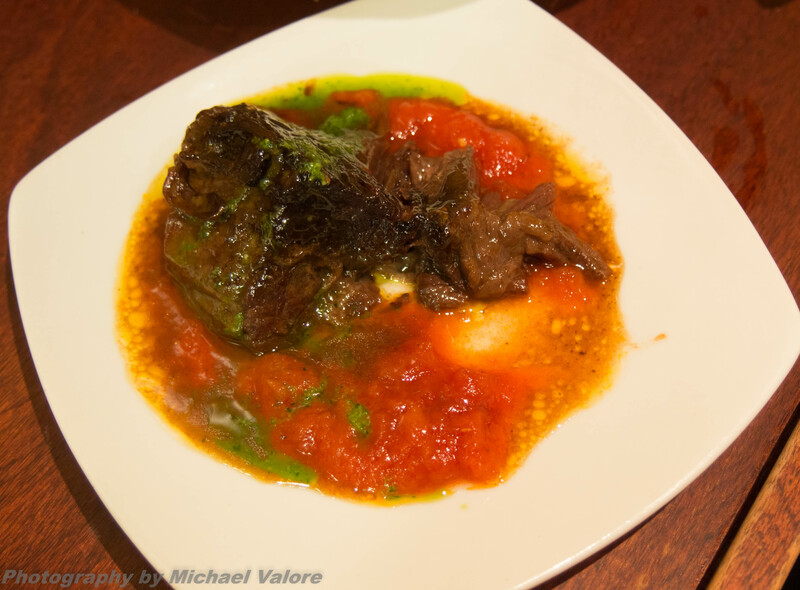 While the two dishes pictured below can be found just about at any restaurant in the area, Vulnetia does them well. 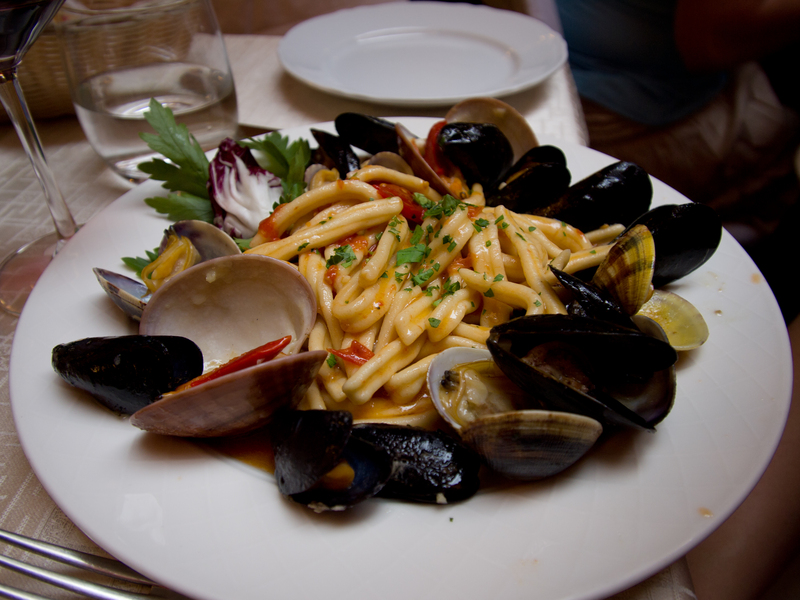 This entry was posted in Travel and tagged Florence, Food, Italy, Olympus EPL-1, Photography, Restaurant, Review, Rome, Vernazza, Wine on August 3, 2014 by Mike Valore. 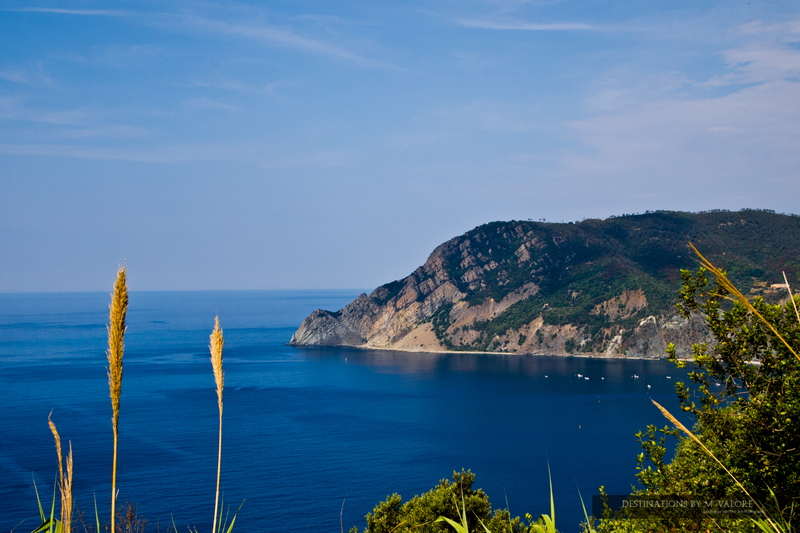 The Cinque Terre was the final stop on our tour of Italy in 2011. We had figured the urban experiences of Rome, Naples, Venice, and Florence would be best followed by a more serene locale. We could not have been better rewarded. 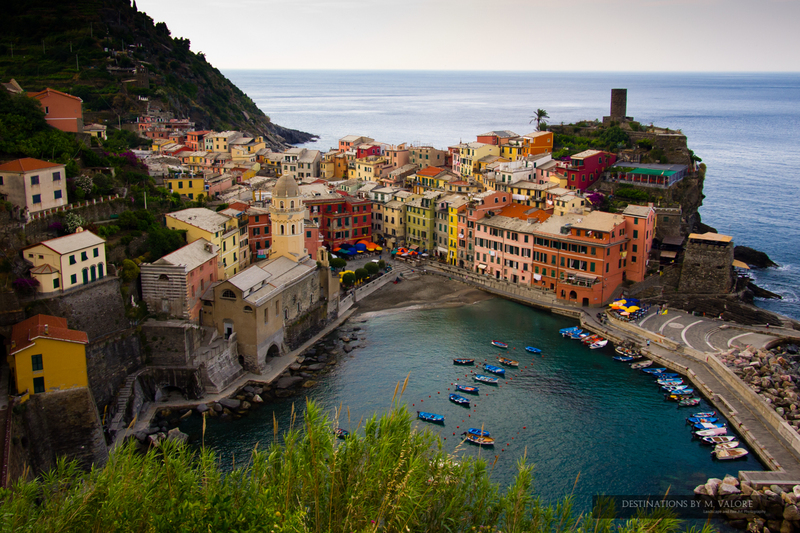 The Cinque Terre region is made up of five towns; Monterosso, Vernazza, Riomaggiore, Manarola and Corniglia. Each town has its differences but they share colorful building facades and beautiful views of the Ligurian Sea. Monterosso is the largest and feels like a resort, having a relatively large beach and a multitude of shops and restaurants. 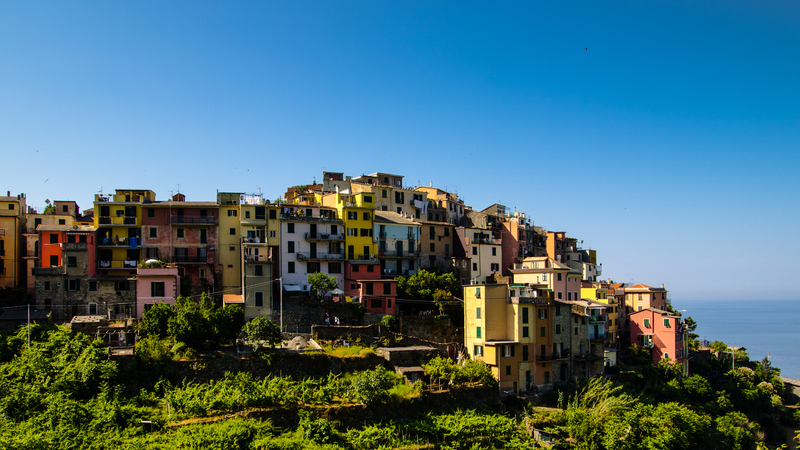 Corniglia is the smallest and is less accessible than the other towns. It has a sleepy feel and is less popular with tourists. It is also the only town of the five that isn’t directly on the water. Riomaggiore and Manarola are similar with a main street leading down to a small harbor inlet. 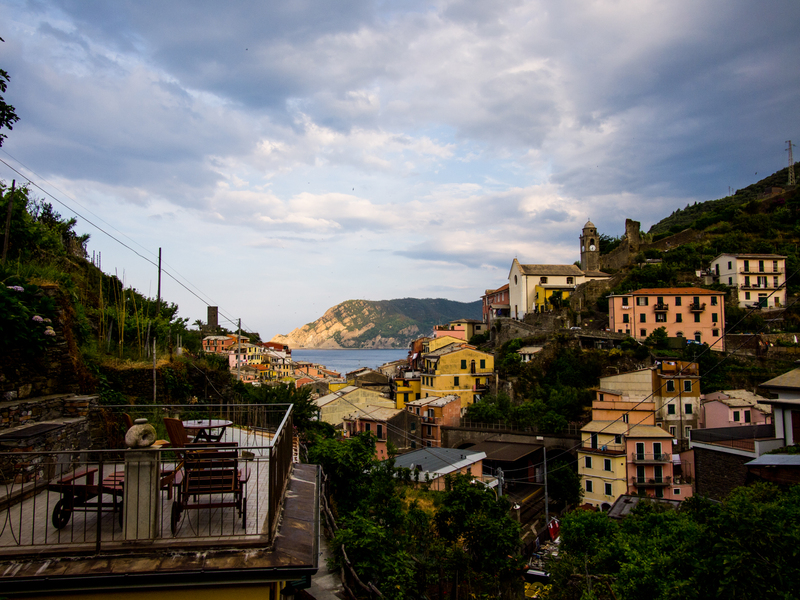 We chose to stay in Vernazza after reading Rick Steve’s recommendations and booked a room at Camere Giuliano. Vernazza is laid out similarly but is smaller, or at least it felt smaller and more welcoming. Pages have been written on Camere Giuliano and the man (Giuliano Basso) who built, owns and runs the rooms in Vernazza that we booked. Check out the link and read some of the Tripadvisor reviews. I don’t recall having met another stranger who immediately commanded my respect in the way the Giuliano Basso did. My wife and I spent several hours chatting with him on the patio during our stay and our time could not have been better spent. Book well in advance. 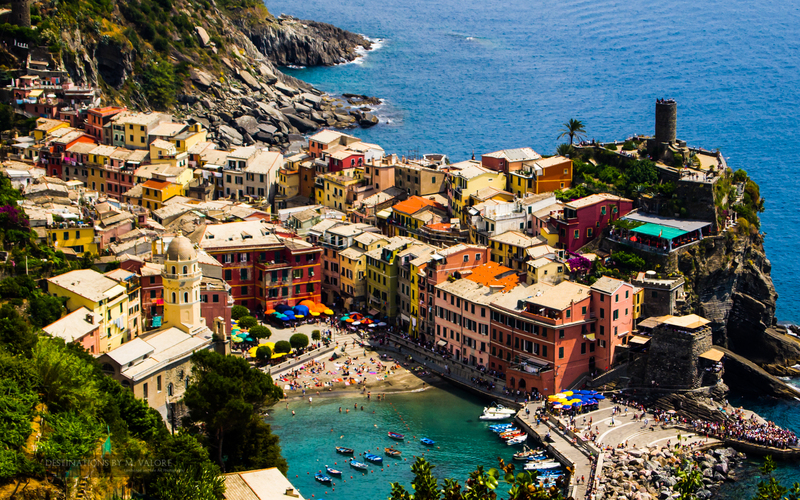 Vernazza has approximately 500 permanent residents. Giuliano noted that additional development is prohibited by the government to preserve the town. The main street runs from the train station down to the beach which is flanked by the old castle and the church. 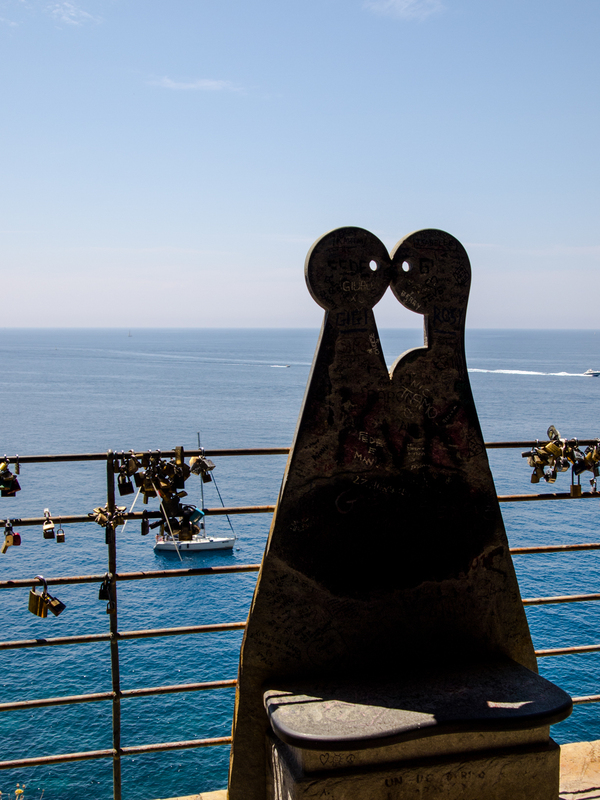 The tower of the castle offers a nice view of the sea and town harbor however the town is best viewed from the end of the dock or the hiking trail to Monterosso. Small shops and restaurants line the street. The beach is small and was frequented by the local children. Not the type of beach to lay out in the sun for an entire day on. 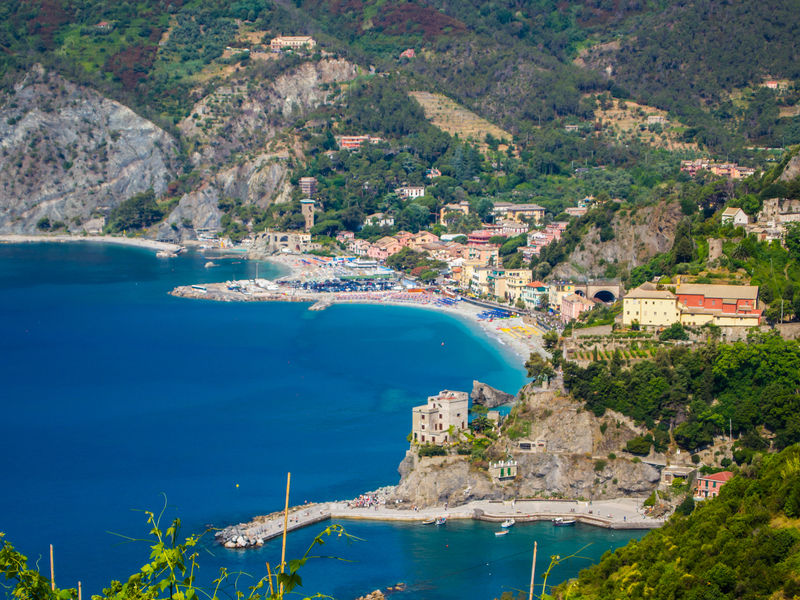 Hiking trails connect all five towns of the Cinque Terre. The trails leading out of Vernazza (Monterosso to the west and Corniglia to the east) are probably the two longest and most difficult, though neither are particularly excruciating. Take enough water, there are no spots to refill. 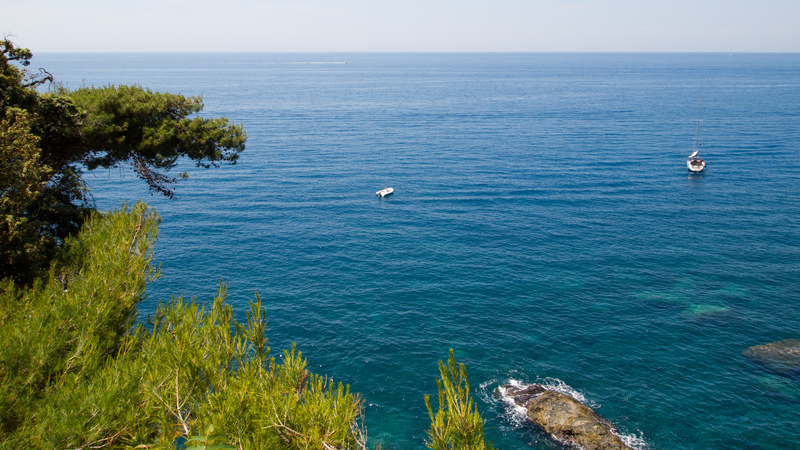 The trails between all five towns run along the sea and offer spectacular views of its deep blue/green waters. The towns are also connected by train which is convenient if you don’t want to hike to and from on the same trail. 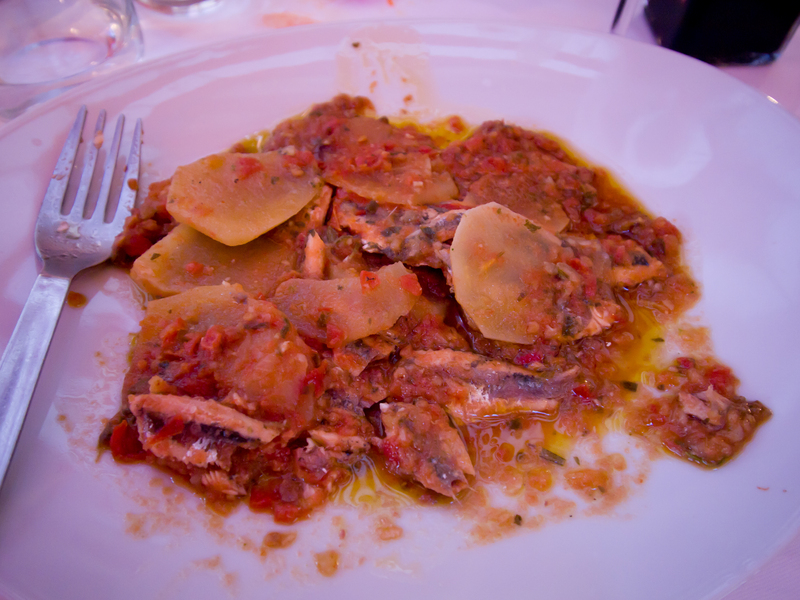 We made it to all five towns on two separate days of hiking and still had plenty of time to relax and dine on the local specialties (Pesto, Focaccia, Anchovies… more in the next post). Check on the status of the trails before departing, Corniglia to Manarola was closed during our visit. Hiking the trails during mid day while tourists pack the towns seemed to be the perfect way to experience this area. 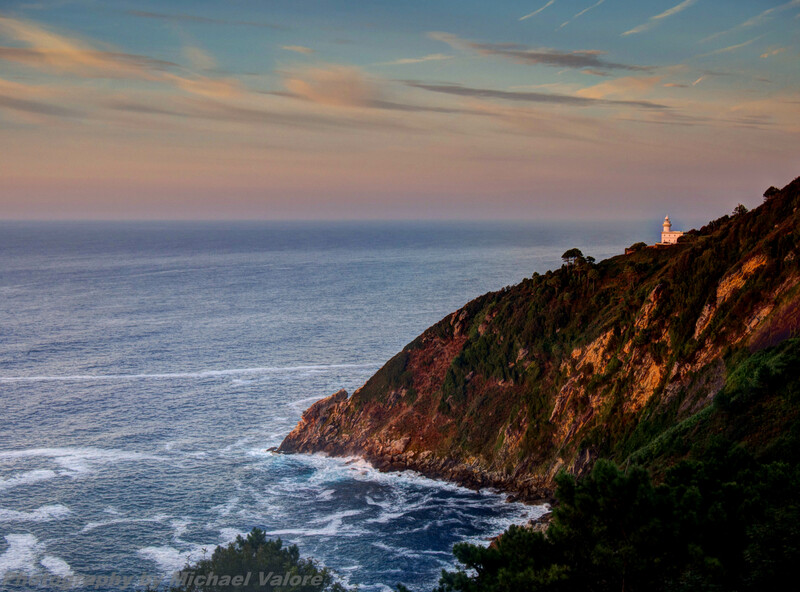 The first two shots below show Vernazza at different times of day, note the crowds in the shot taken in mid-afternoon. The mornings and evenings were peaceful with far fewer people roaming about the town. Shortly after we had left, in the fall of 2011, extremely heavy rains caused severe flooding and landslides, causing significant damage to Vernazza and Monterosso. 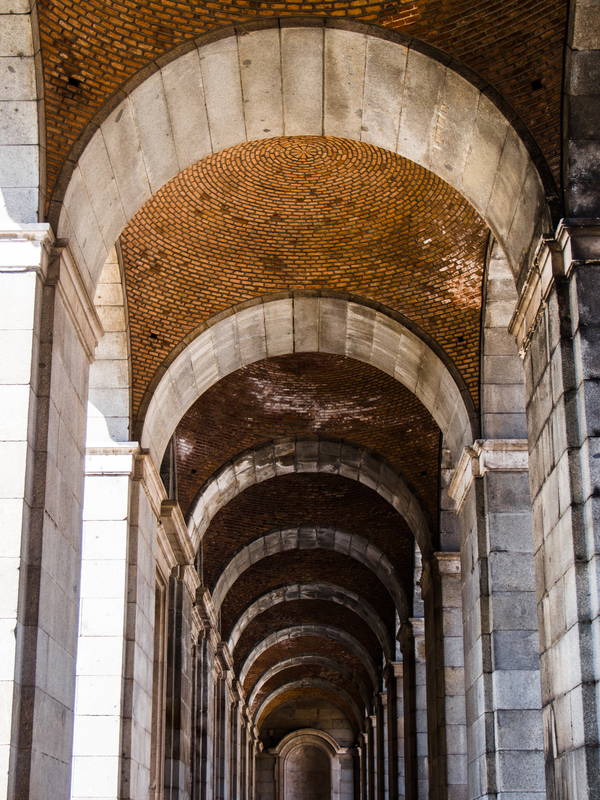 The Save Vernazza website has a wealth of information on the destruction and also the efforts that have taken place or are underway to restore or even improve upon this beautiful town. Rick Steve’s also has some good information on the recovery. It appears that the trails and businesses are back open and the towns have recovered well. Perfect end to our trip. This entry was posted in Travel and tagged Cinque Terre, Corniglia, Hiking, Italy, Manarola, Mike Valore, Monterosso, Olympus EPL-1, Photography, Riomaggiore, Travel, Vernazza on July 10, 2013 by Mike Valore.